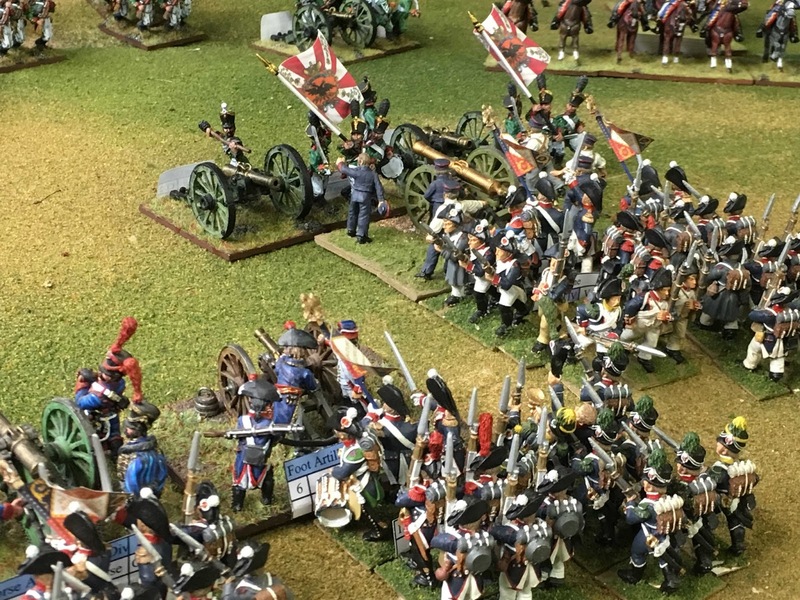 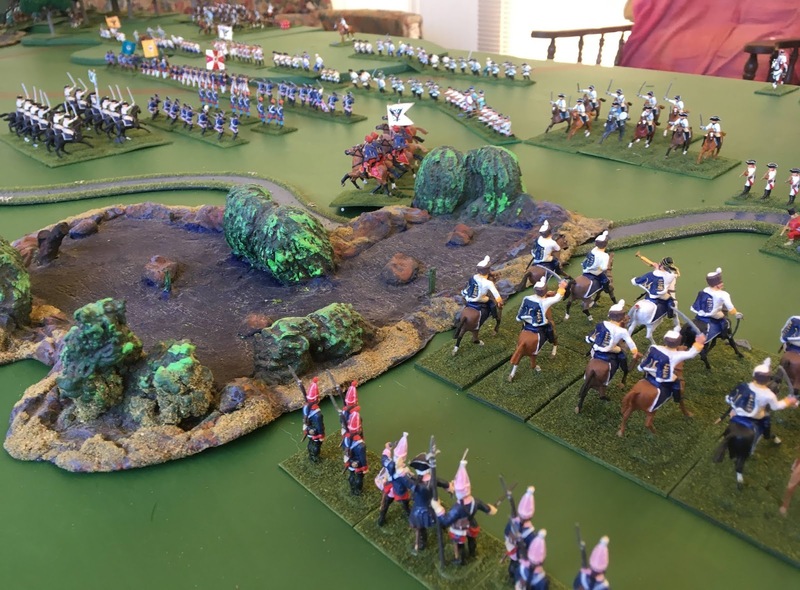 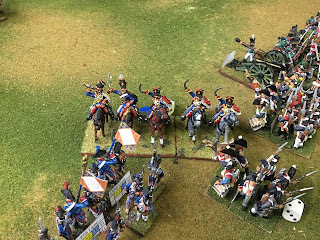 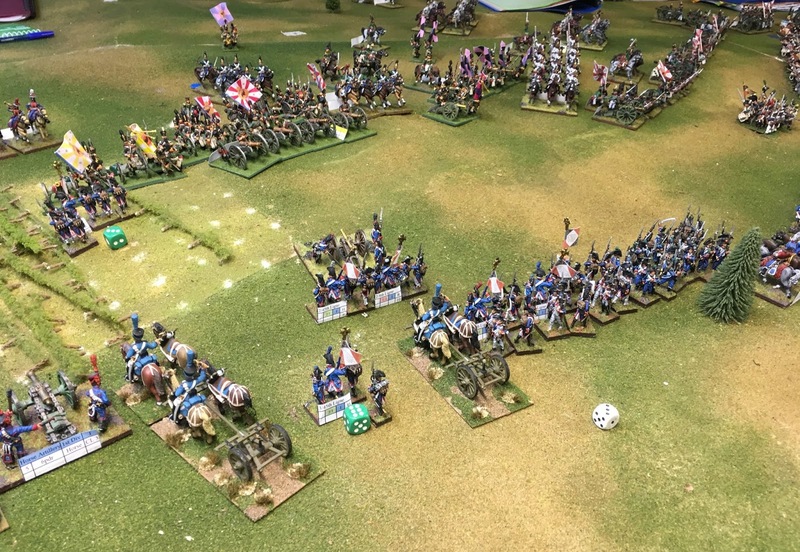 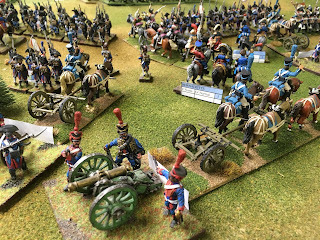 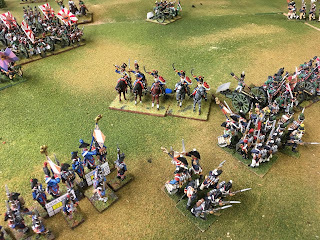 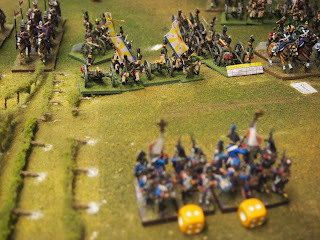 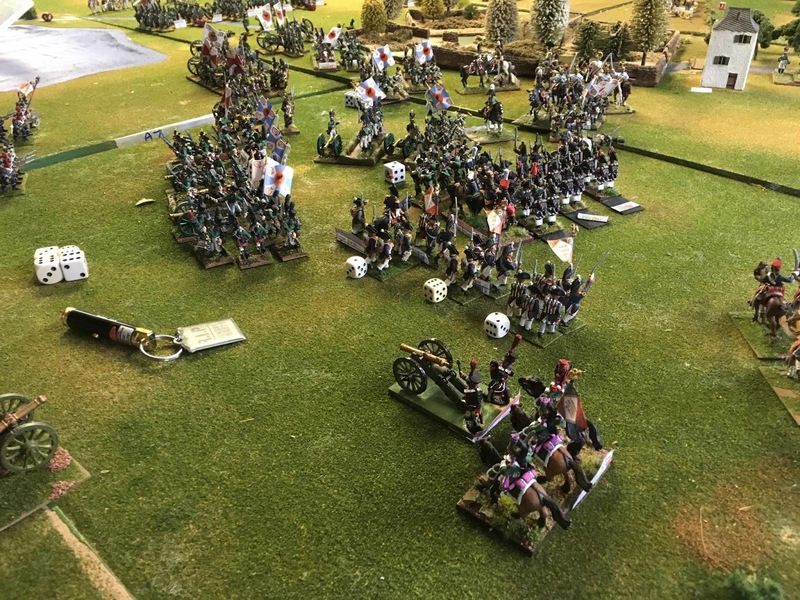 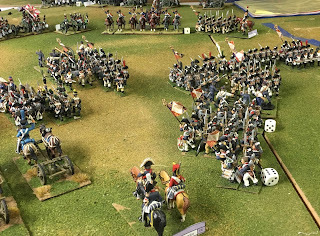 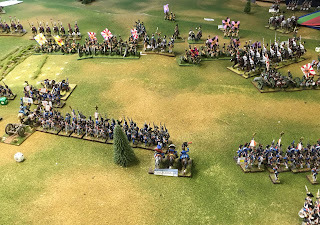 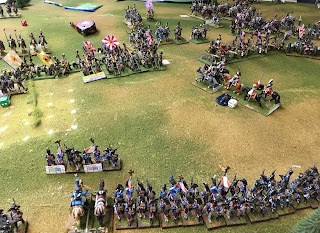 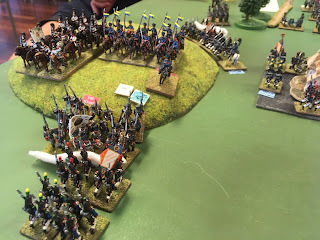 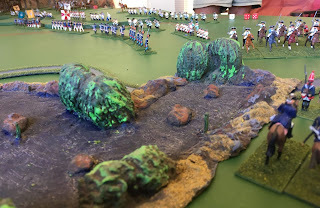 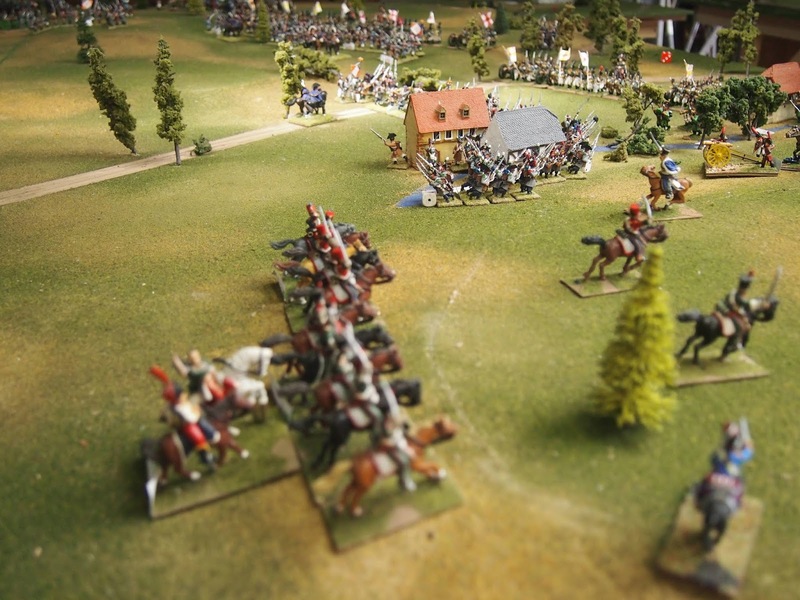 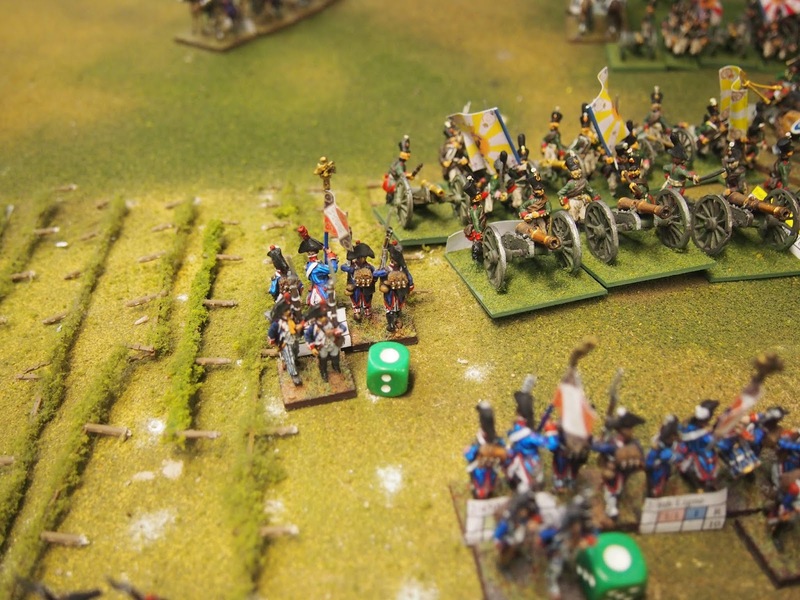 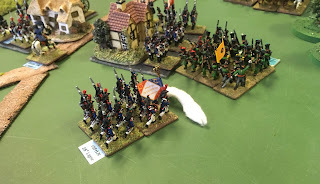 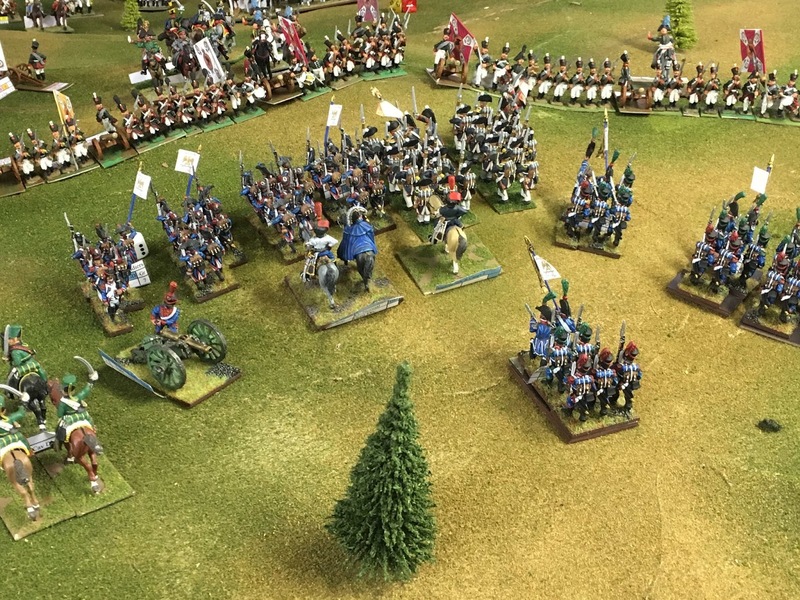 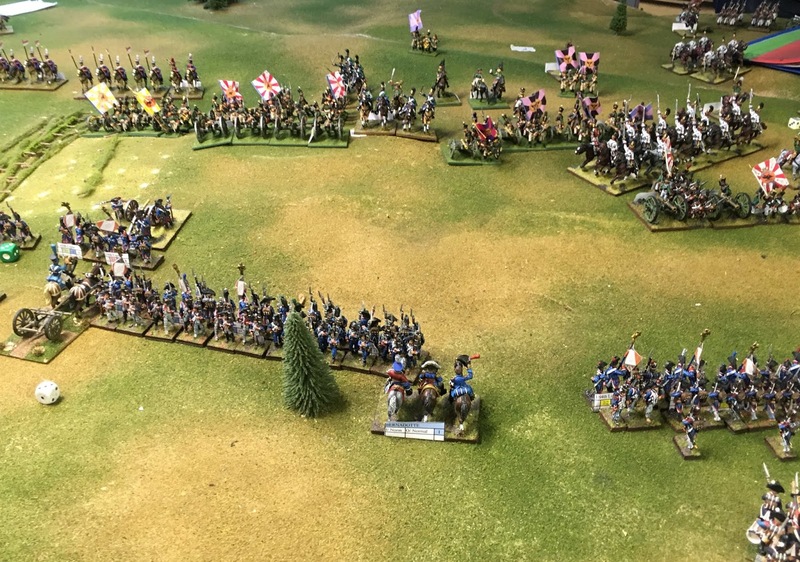 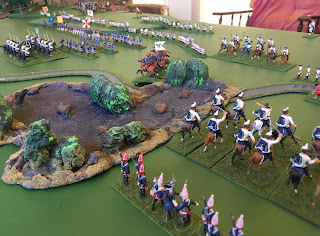 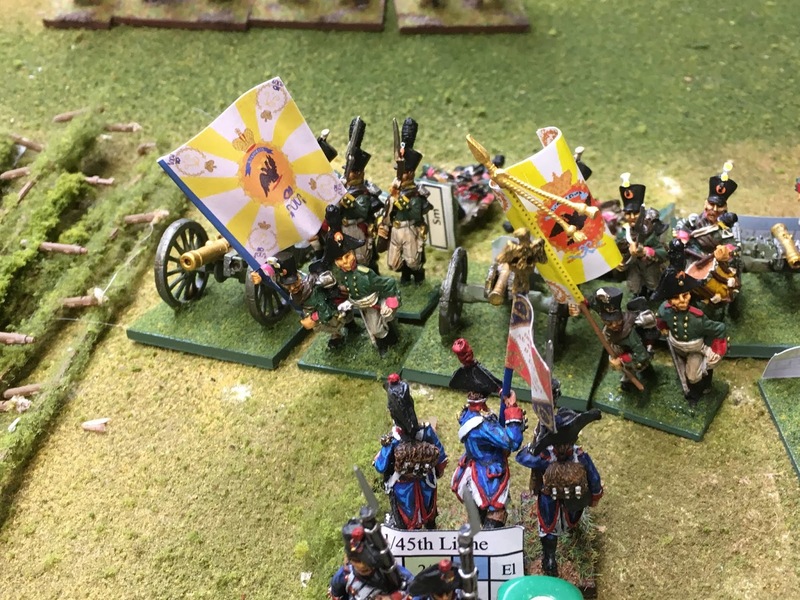 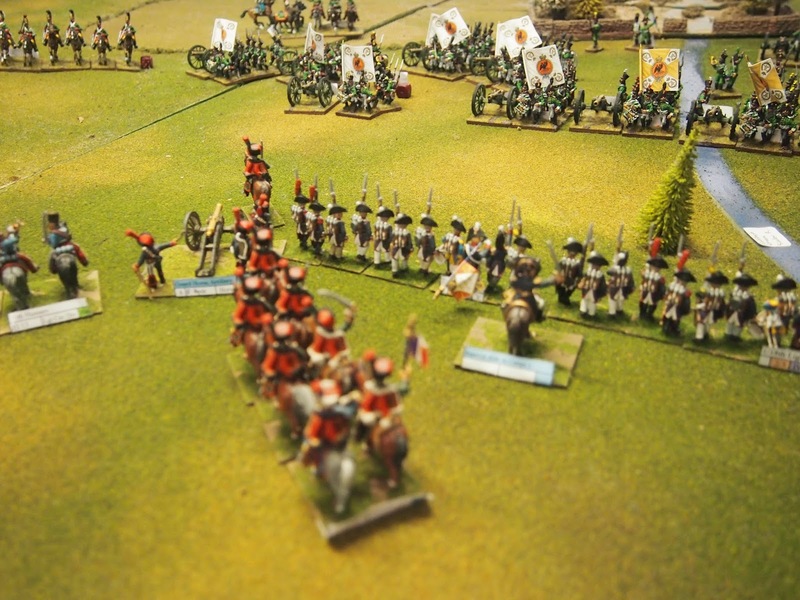 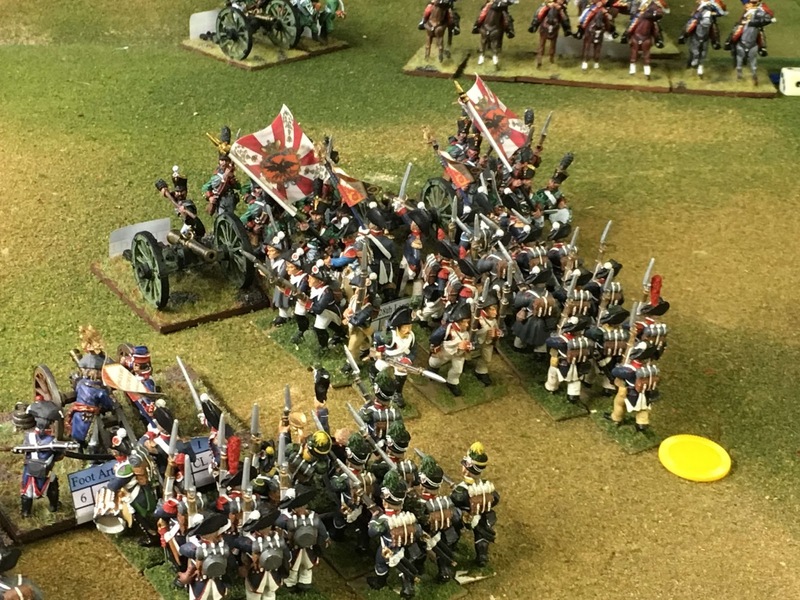 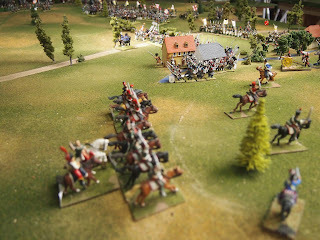 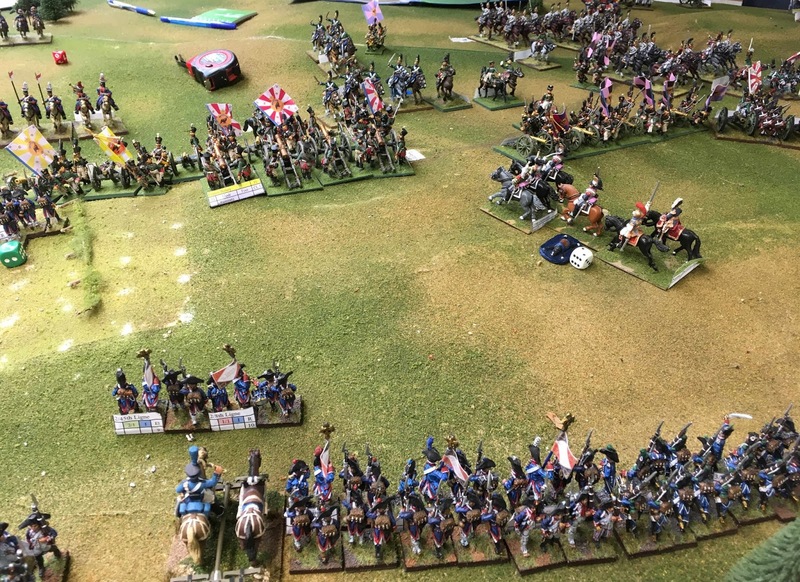 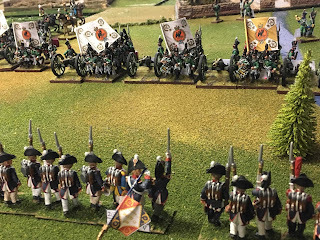 Wilko and I caught up on the weekend for a small and most enjoyable Seven Years' War game. 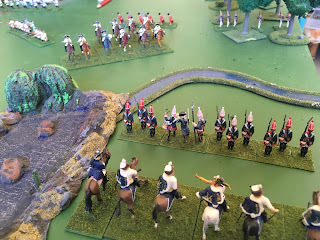 He was 'master of ceremonies' providing all for this small action which came from Volume 1 of Charles Grant junior's excellent scenario books. 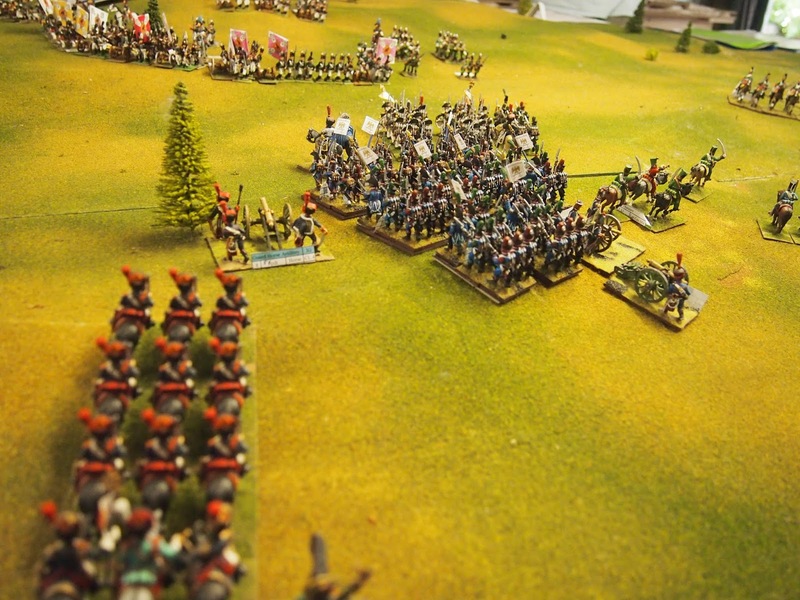 Originally a rearguard-withdrawal by the Imperial-Austrian forces (quelle surprise! ), Mark decided that they would not over-estimate the on-coming Prussians and we'd run it as a straight fight. 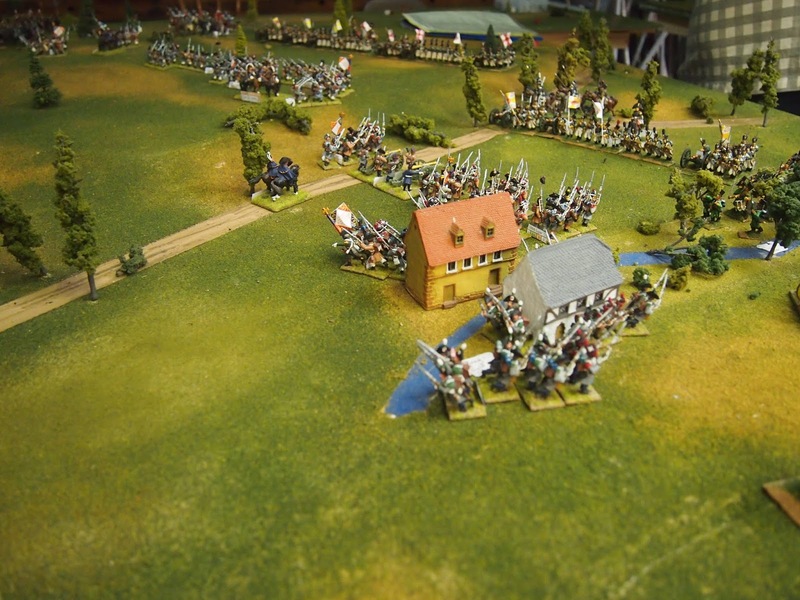 I took the Prussians, lead by General Finck (bringing to mind the "Wizard of ID") and Mark the Imperial-Hapsburgs. 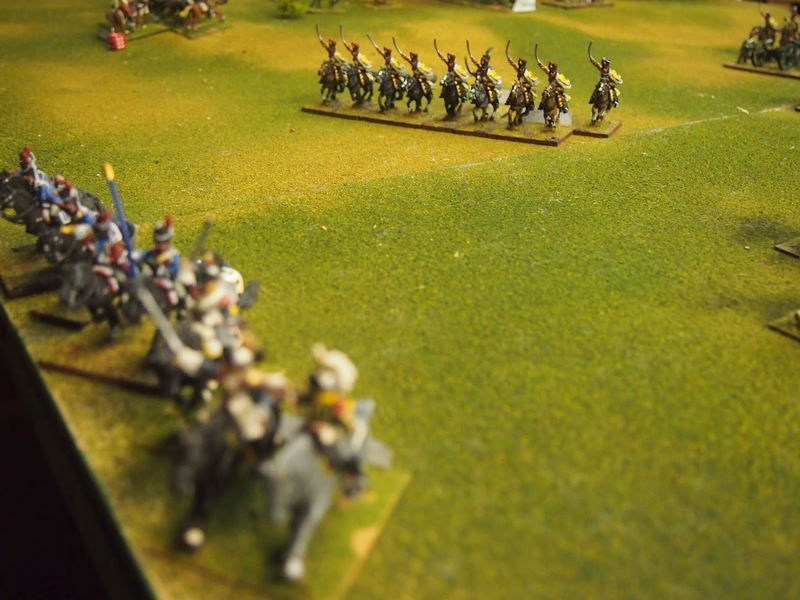 I decided to use the subtle tactic of 'advance the whole line'. with 1st brigade's single grenadier battalion and Belling hussars trying to get around the Imperials left flank, while 2nd brigade's Szekely hussars, a battalion of the Puttkamer regiment and freies bataillon Collignon tried a left-hook through the woods on the enemy's right. 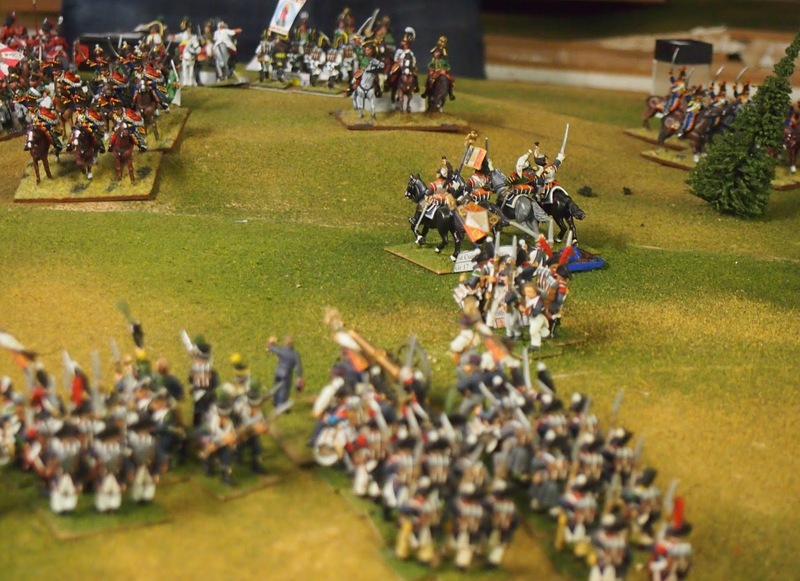 Meanwhile the centre advanced 'a les prussiennes'. 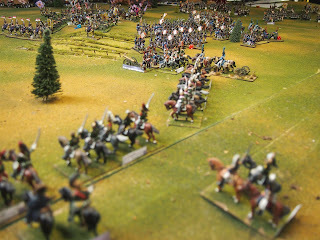 Things seemed to be progressing well, although the Belling hussars refused (twice) to charge the infantry ahead of them. 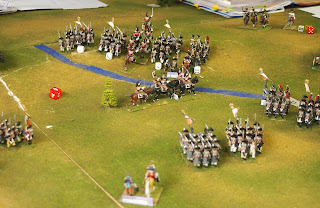 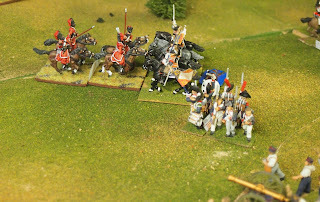 In the centre I had advanced the infantry ahead of the supporting Horn cuirassiers in what was to be a critical mistake. 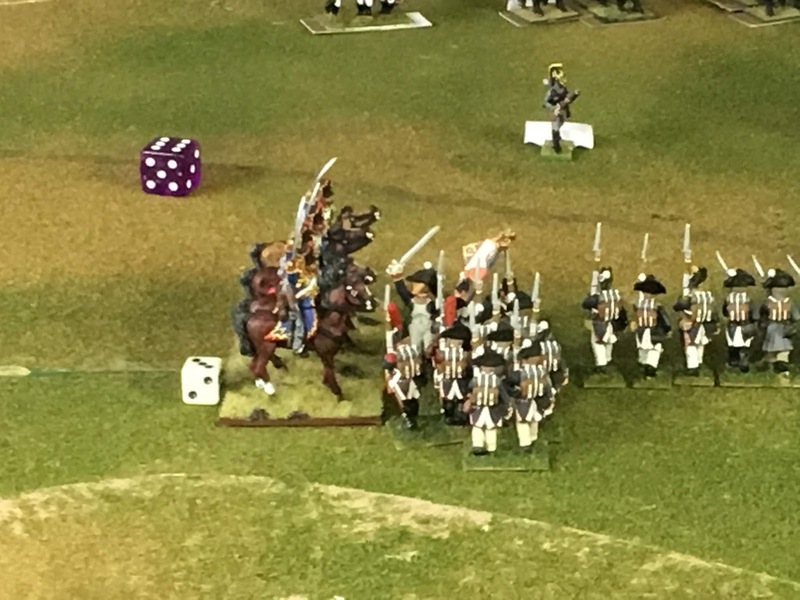 Two wins for the underdogs! 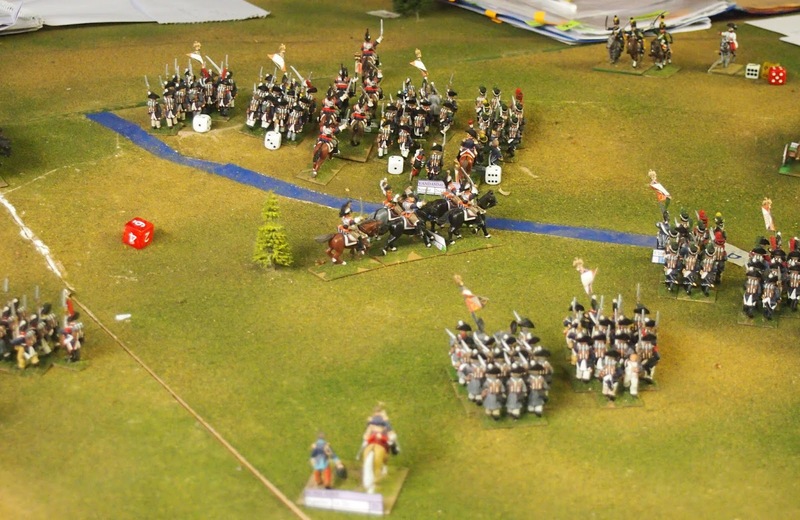 Finally, the Belling hussars charged the infantry, taking fire on the way in, but winning the low-odds mêlée. 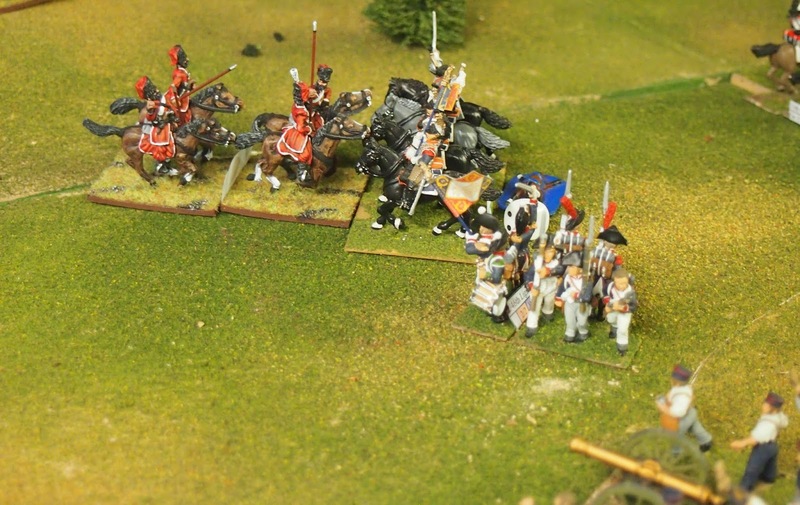 They then sensibly withdrew behind the grenadiers. 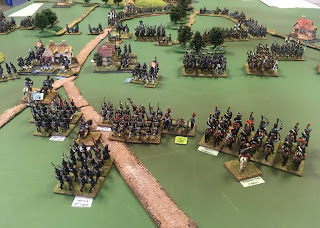 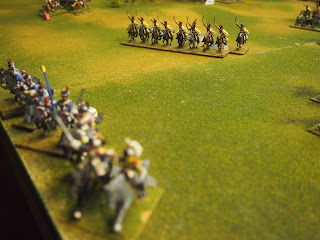 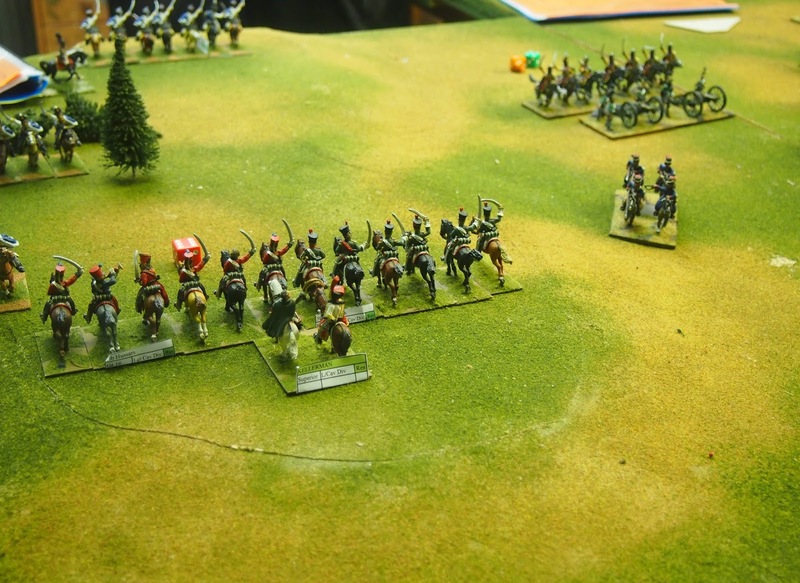 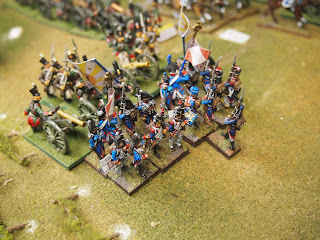 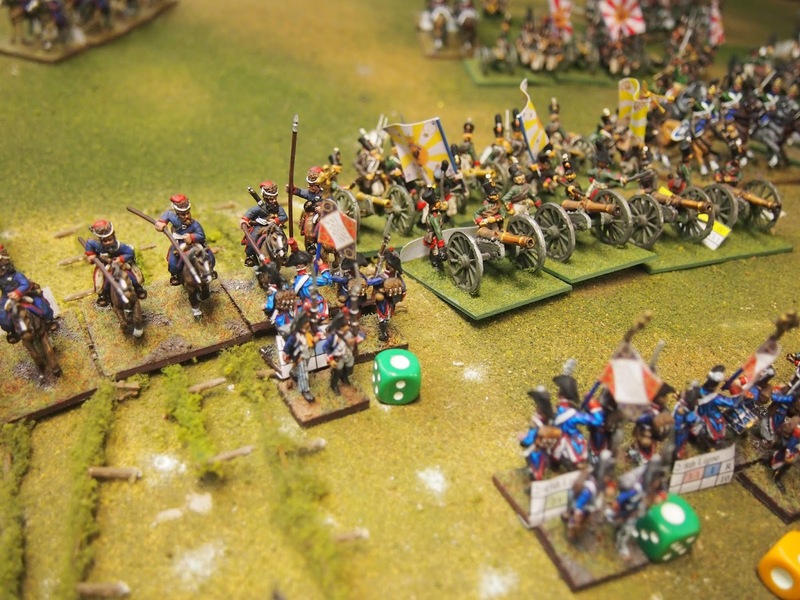 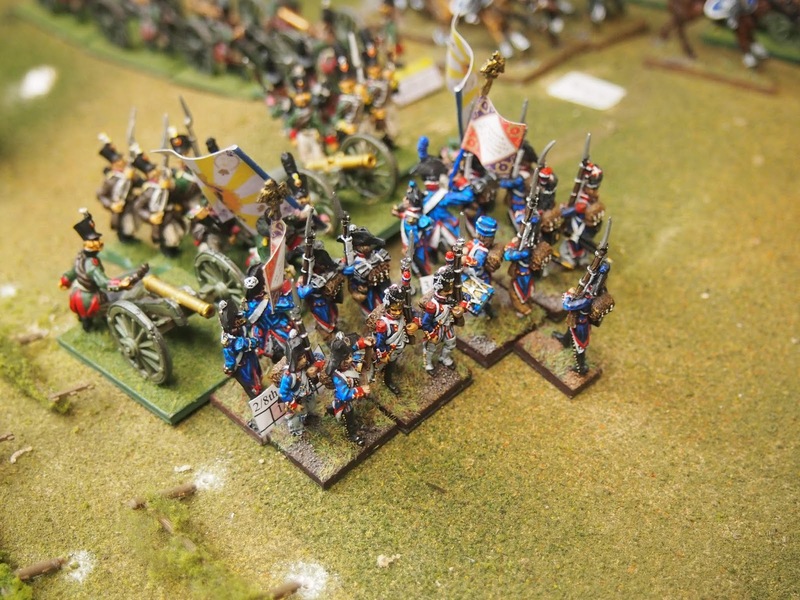 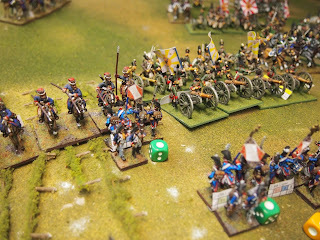 (The Imperial dragoons seen in the distance later charged the grenadiers who sent them off with a 'bloody nose', thanks to better dice in a mêlée with dead-even factors). 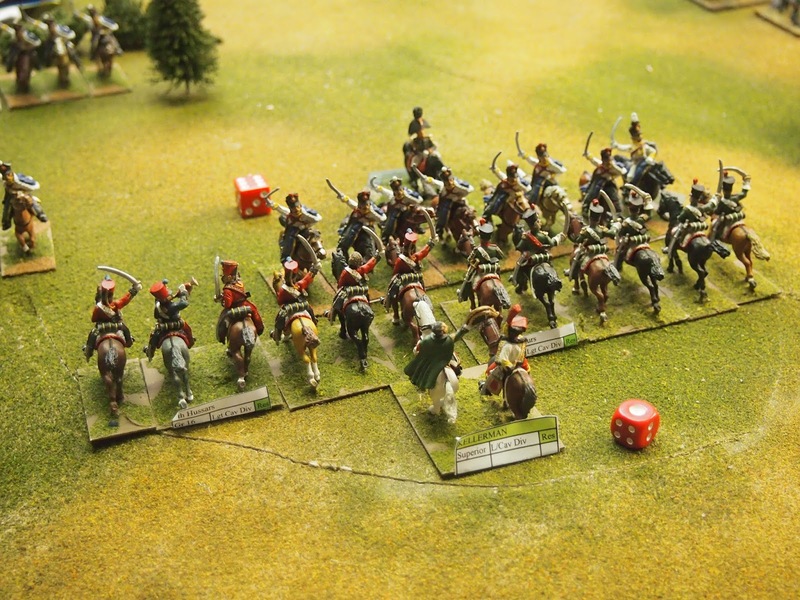 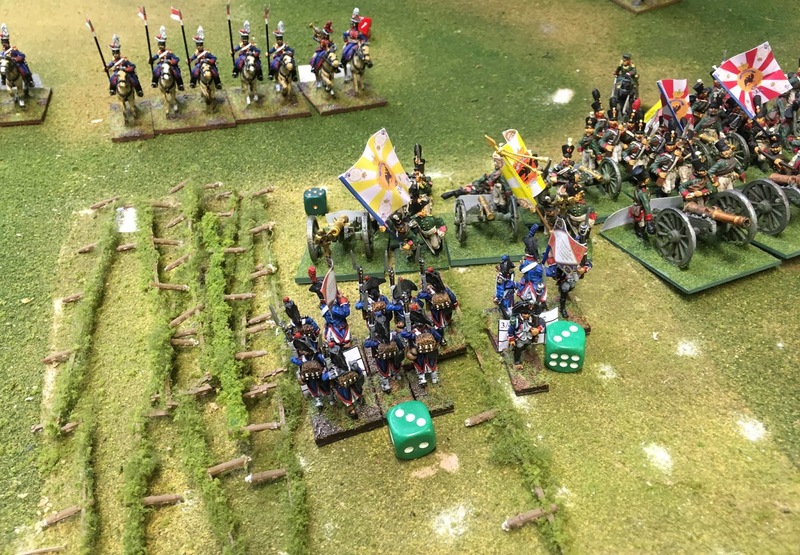 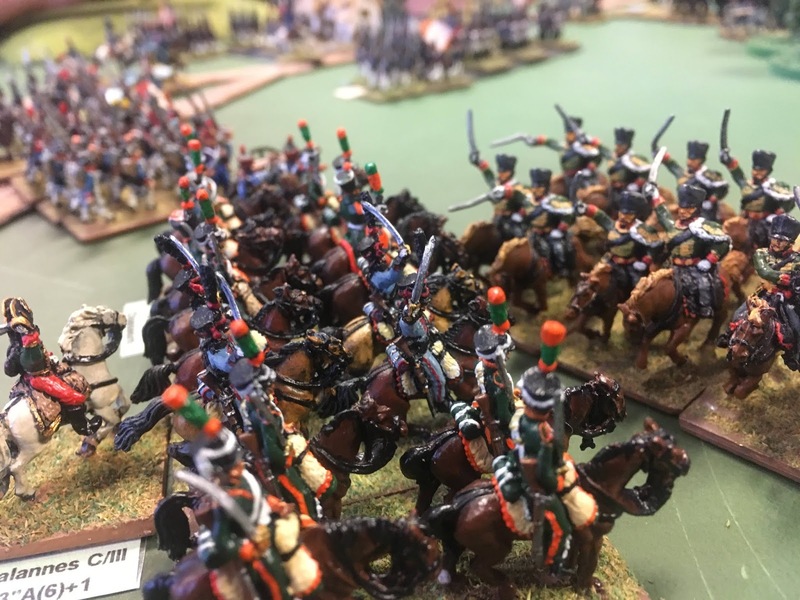 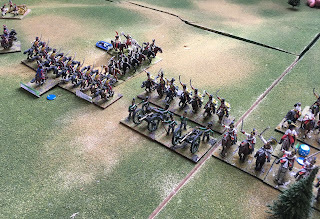 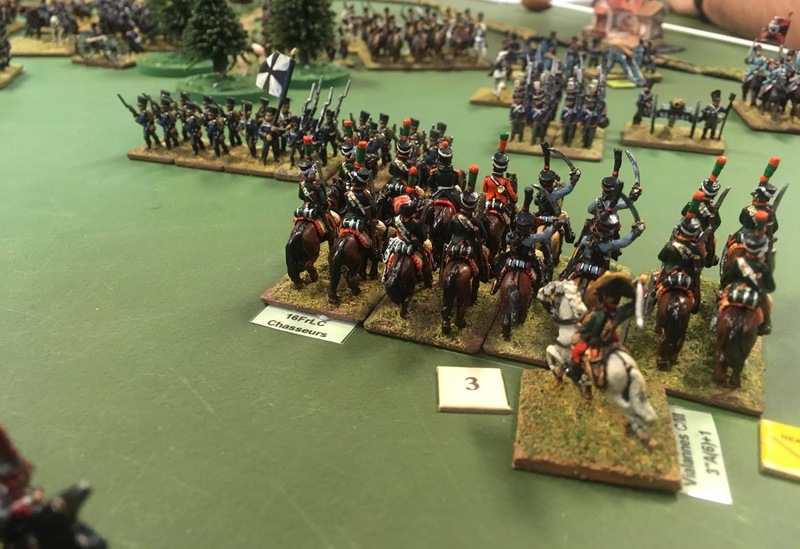 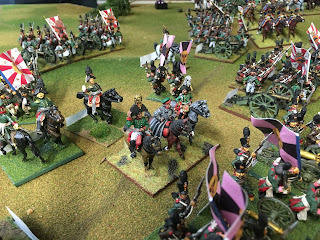 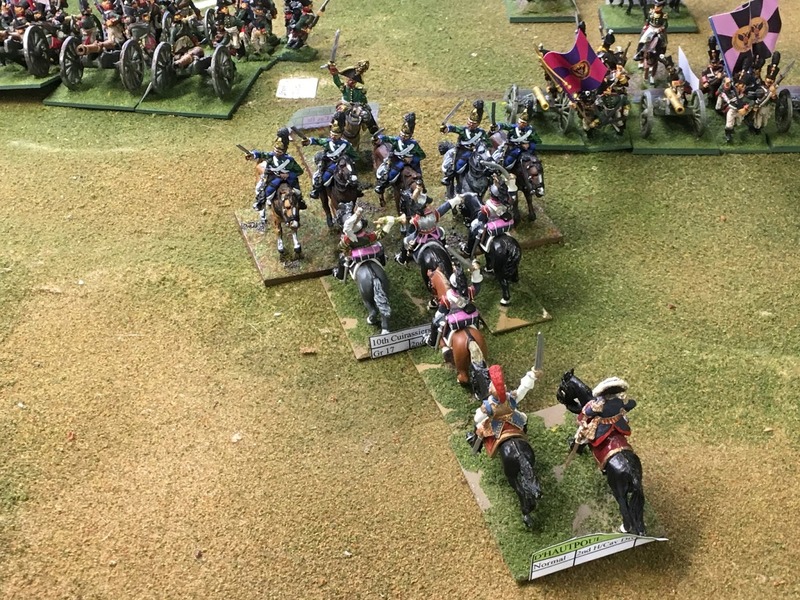 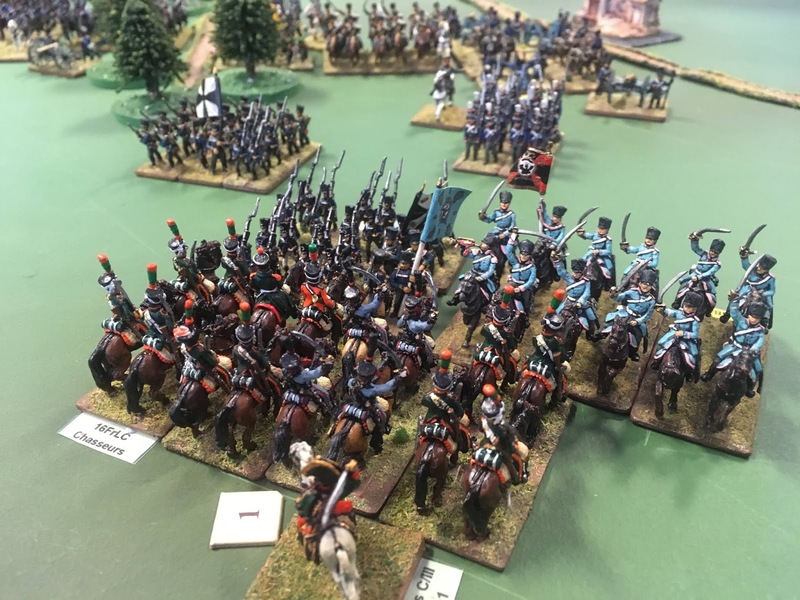 Not to be outdone, the small unit of Imperial hussars charged the Horn cuirassiers in the flank, won their own low-odds mêlée and rode on to take out one of the Prussian batteries. 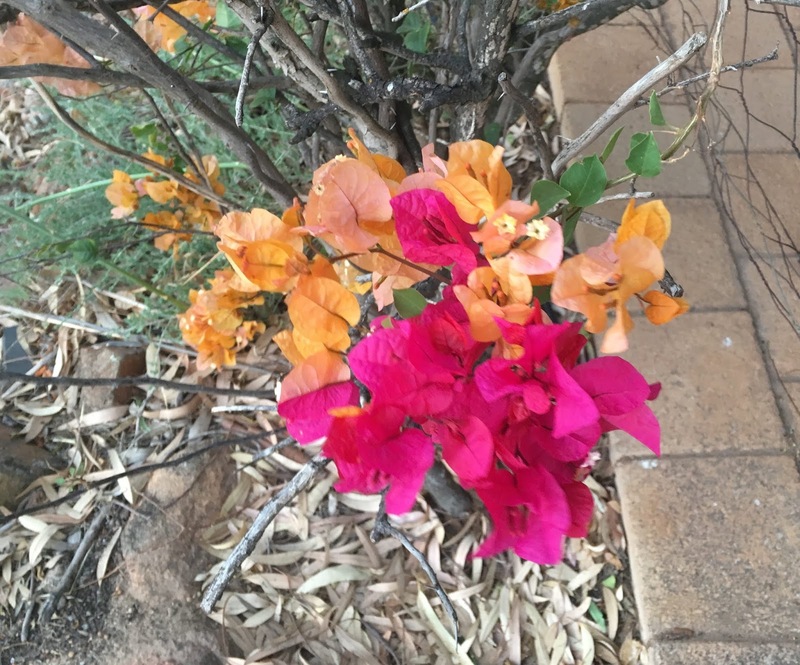 They withdrew, having scored this considerable prize. On the Prussian left, the flank force had done better than expected. The Szekely hussars and battalion of the Puttkamer regiment worked through the woods to emerge on the right of the Imperial army, while the freies bataillon Collignon harassed and drove off the lead infantry battalion—I did not get that one in a photo, so you'll have to take my word for it! In the centre, the lines of infantry had been wearing one another down, neither side gaining the ascendency. 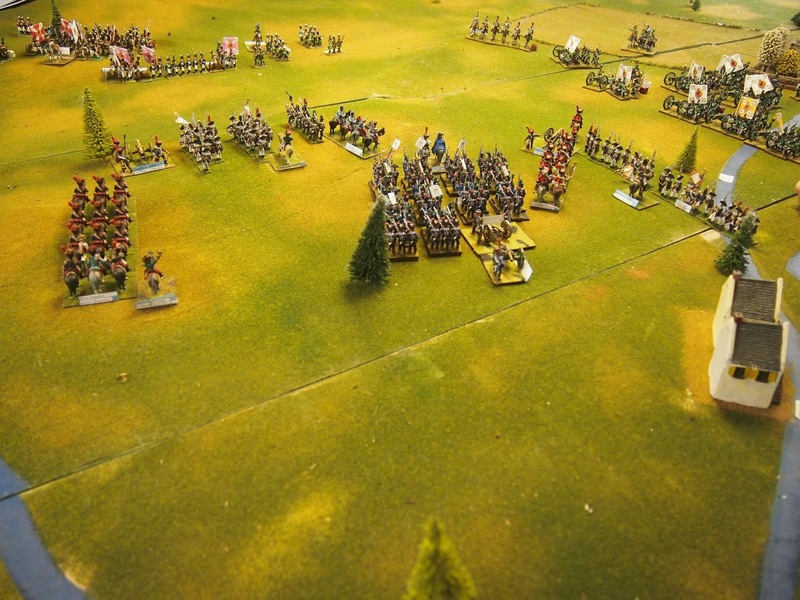 In fact, so much so that both armies needed to take a withdrawal test for 1/3 army losses, which both failed*! 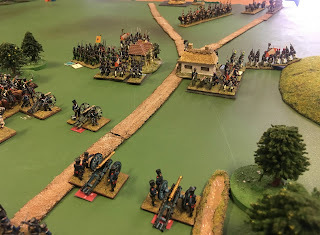 With losses about even, the game was called a minor Imperial-Austrian victory as the captured/destroyed battery tipped the victory points in their favour. A great little game, lasting a mere six turns, but which provided a lot of interest, nail-biting close combat decisions and loads of fun. 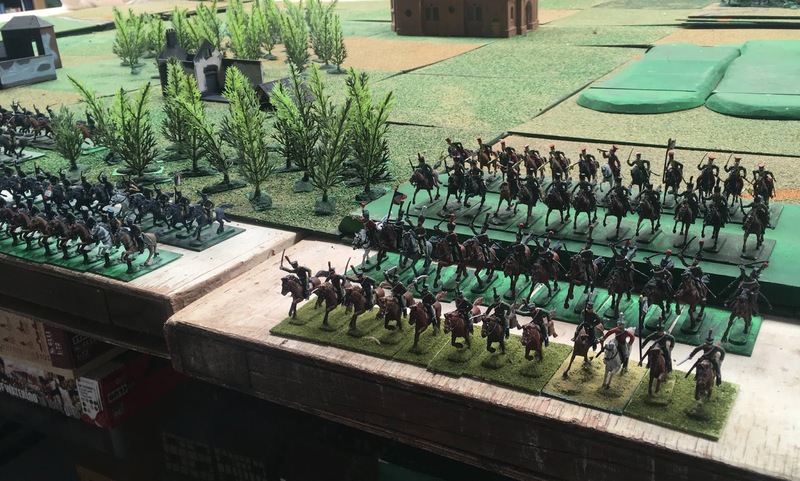 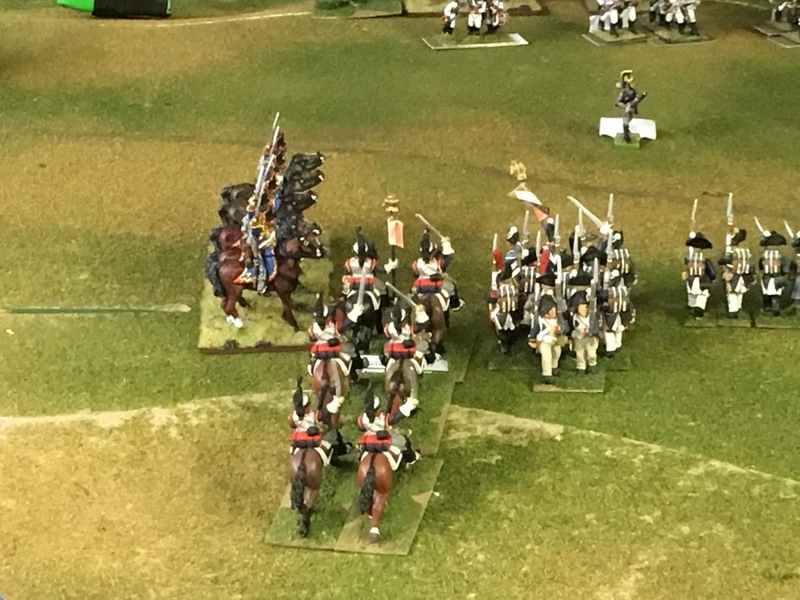 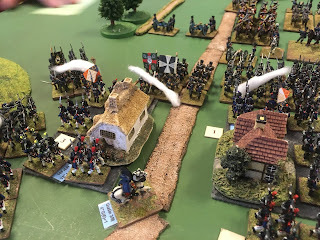 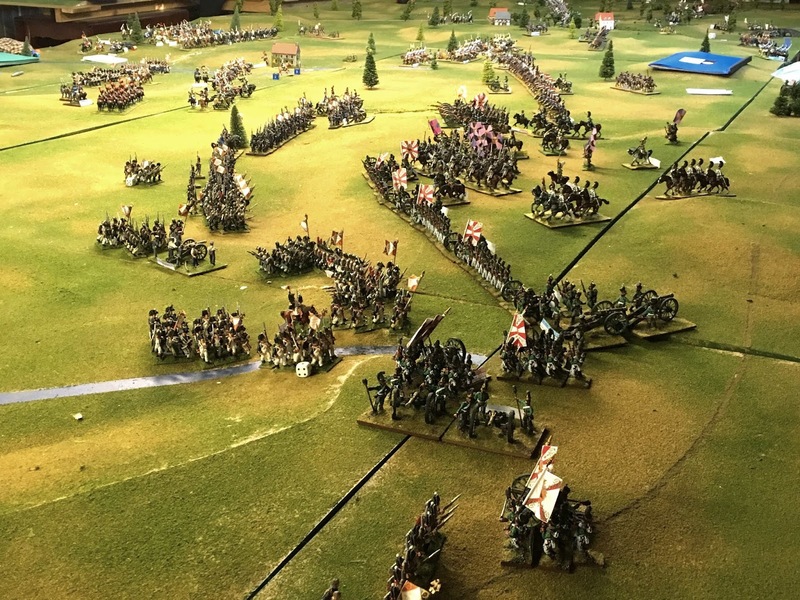 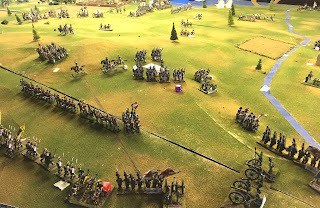 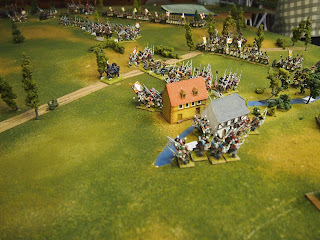 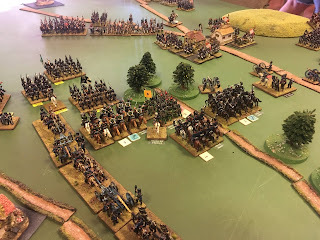 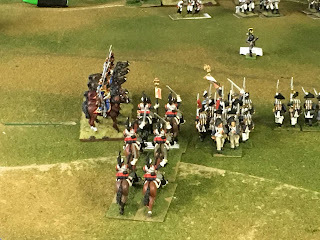 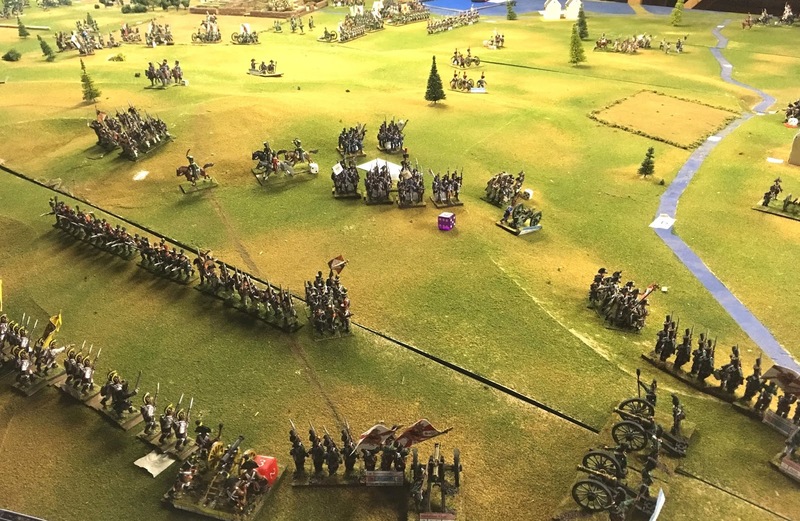 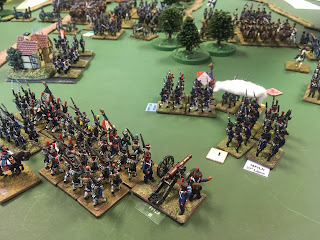 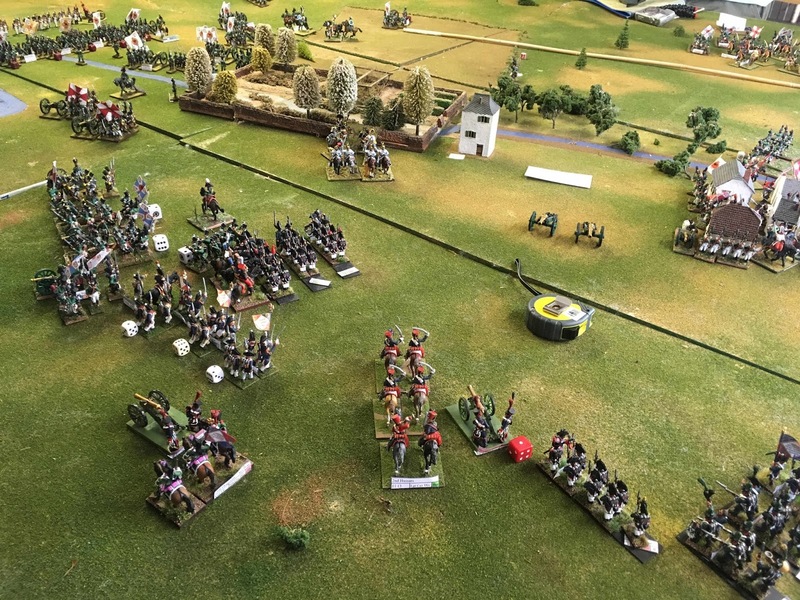 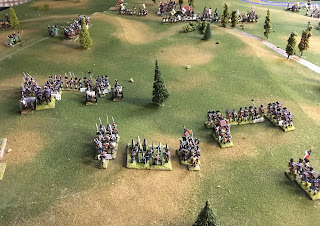 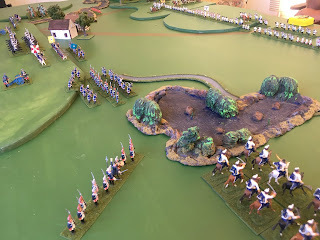 As trailed by James, today Mark and I ventured for the first time into ACW wargaming with a rules-test of the well-known Fire and Fury (1st Edition). I selected the Battle of Dranesville for the test. 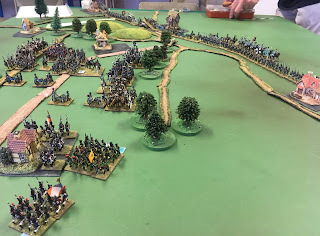 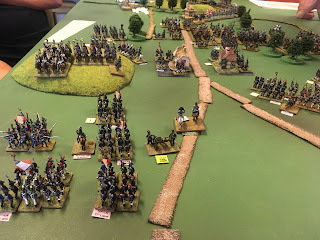 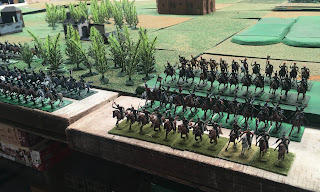 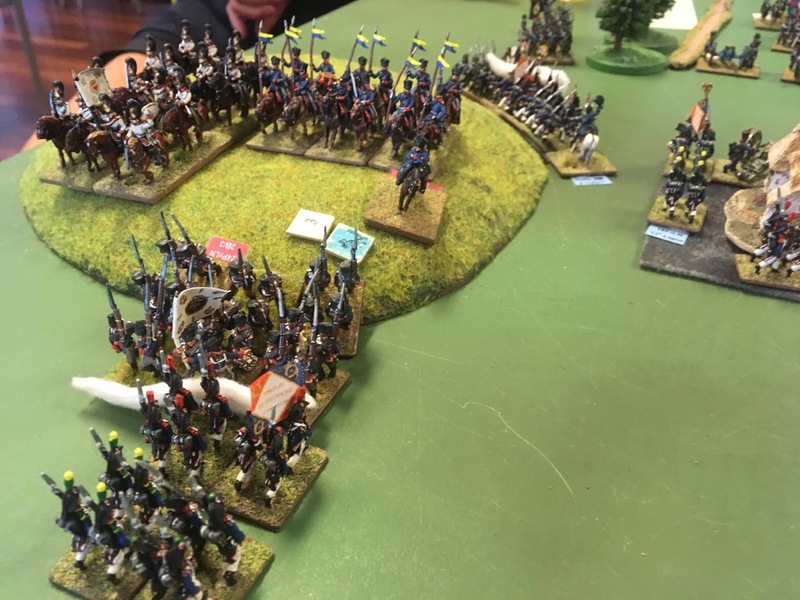 An early-war encounter with, I reckoned, pretty much the right balance of troops - four Rebel regiments, five Union, plus a few cavalry and batteries, and a sufficiently testing scenario for us. 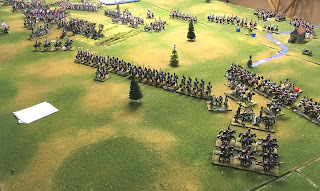 And a Union victory, which gave me something to emulate as Brigadier-General Ord, and something to avoid, as Mark's Jeb Stuart. 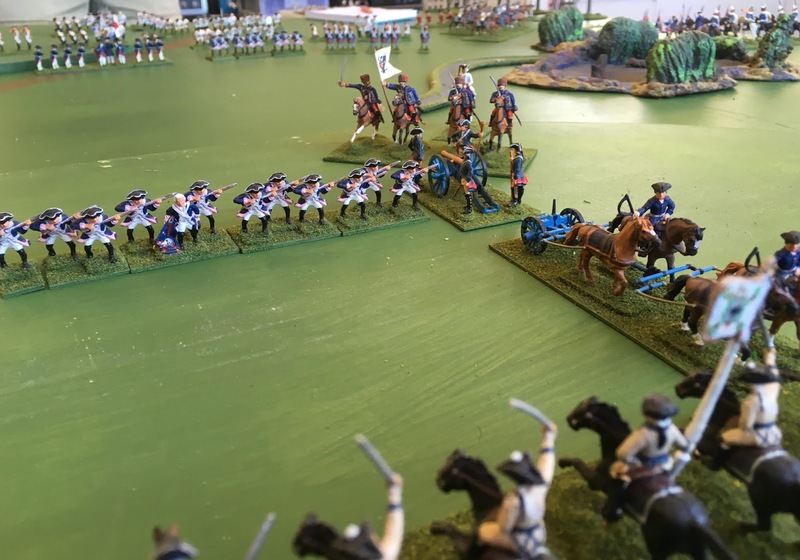 You will have to make your own judgement as to whether I reached a sufficiently close approximation of the outset of the battle in my own recreation of it - and indeed on whose sketch came closer to reality. The view below is from above Dranesville, looking ESE along the line of the battle, with the Union line about to enter the wood and the Rebels ensconced within it, their artillery ready to fall on Kane's 1st Pennsylvanians. 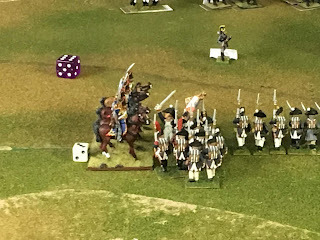 A regiment, but an early war regiment and hence like all the other regiments treated in this action as a small five stand brigade. How would the rules stack up? 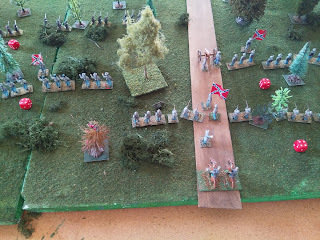 Historically casualties were slight, some 194 on the Rebel side and 68 Union. 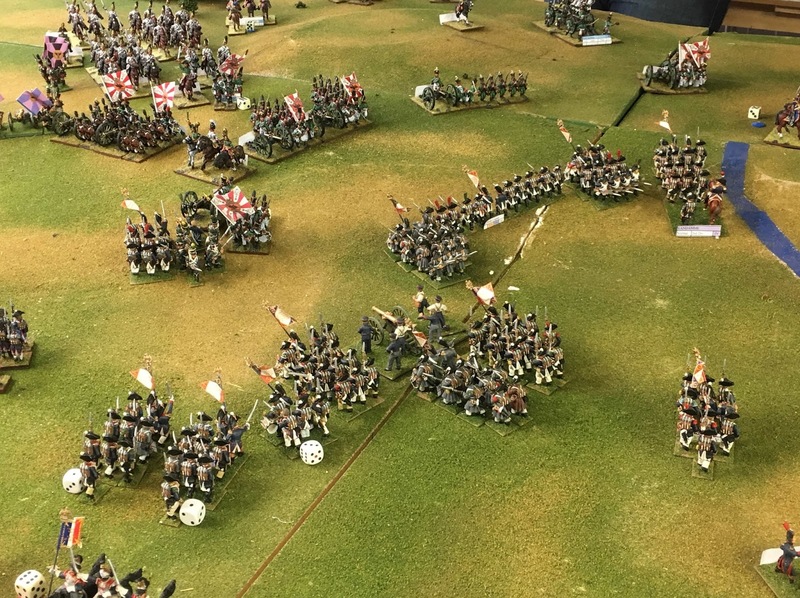 Would Fire and Fury live up to its name, rather than verisimilitude, and deliver a bloodbath? 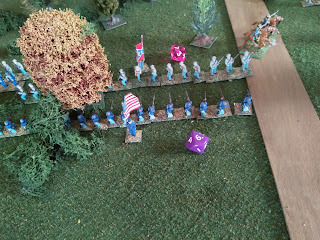 The Rebels came up all veteran, which was very nice for them. 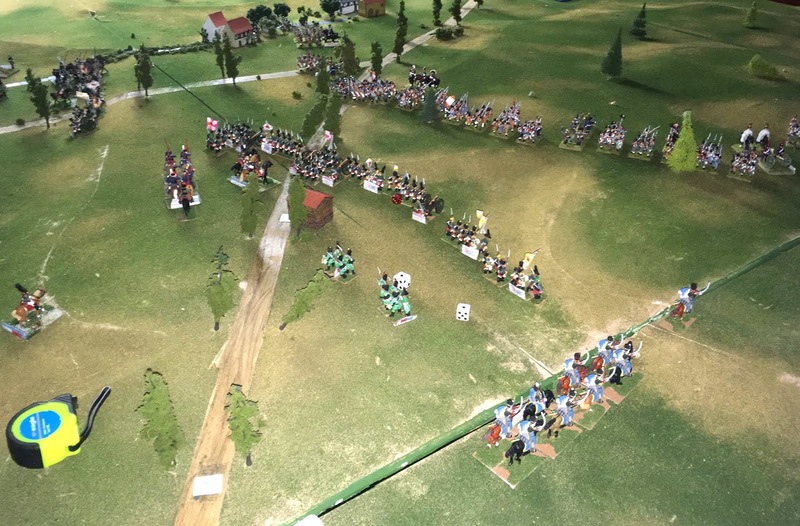 The Union fared a little worse, the 9th and 12th Pennsylvania - the two regiments in the right vanguard in the picture below - both turning out green. 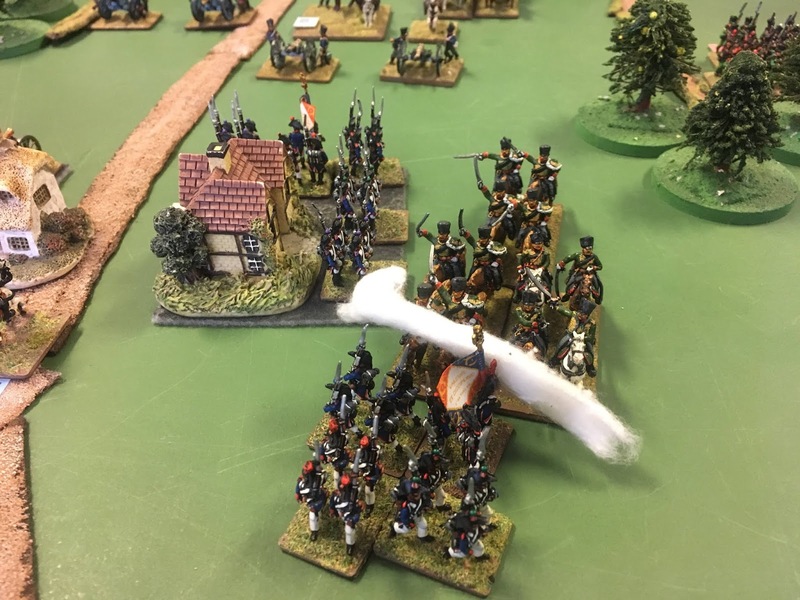 Not a good omen. 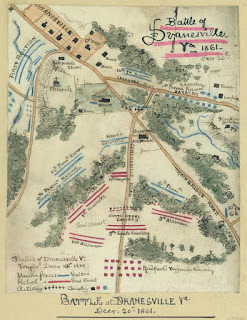 Note Brigadier-General Ord with the reserve, the 10th Pennsylvania. 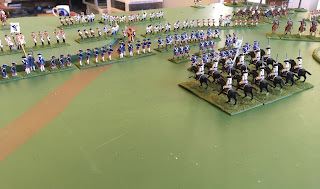 His position there meant that his leftmost regiment, the 6th Pennsylvania, was out of command. 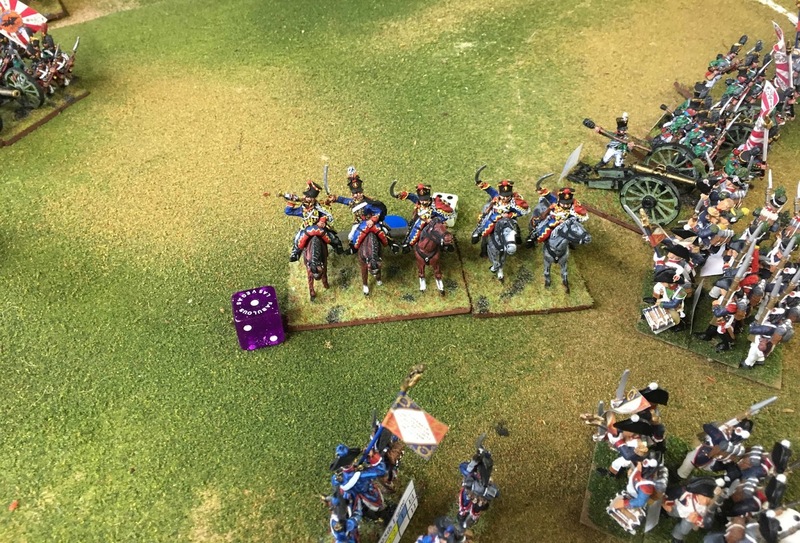 He had better remedy that swiftly! 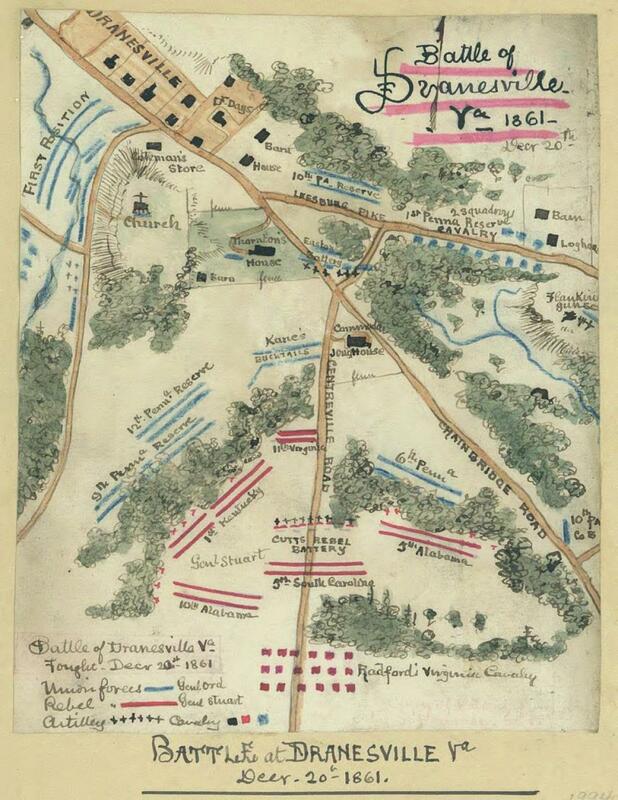 If you look carefully you might also be able to pick out Jeb Stuart in the distance along the Centreville Road. He's also too far away for anyone to take a shot at him. 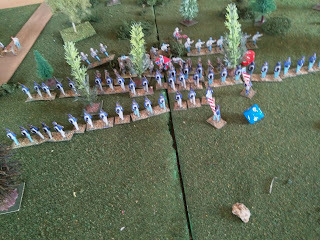 ...but it was the third move, where the 12th Pennsylvania had replaced the 9th in the line after they had become low on ammunition in a useful disordering of their Kentucky opponents, where the two sides became embroiled in successive melees. 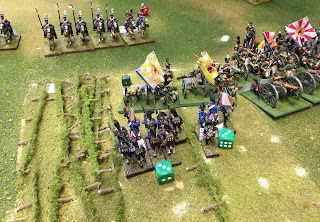 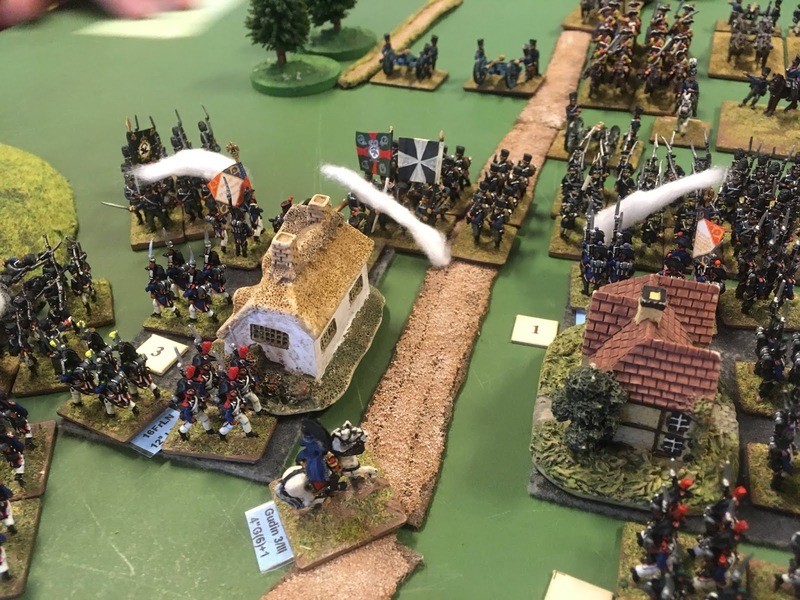 Although the Rebels duly got their obligatory +1 on the charge, the melee first became a desperate struggle, with both sides losing a stand (representing 150 men) on the second attempt to settle matters things went hopelessly wrong for the rebels as a result of the dice. Historically, these men did not get into such close quarters, but the result ended the same: one unit of the Kentucky skedaddled, and the Rebels retired on their left flank. 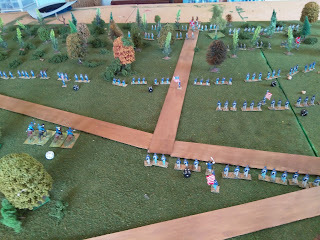 The Union battery finally got going towards the hill on move 4, in which the 12th Pennsylvanians replaced the 9th in the line. 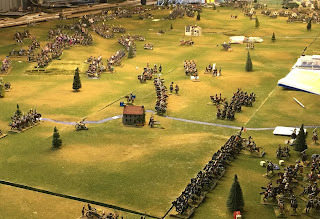 Elsewhere, fire even in the open proved relatively ineffectual, much to the relief of Kane's men, who had been exposed to Rebel artillery fire for the best part of two hours until they could get out of the direct line of sight along Centreville Road, but who were still more accurate in their fire than the 11th Virginia opposing them in plain sight out of the woods. 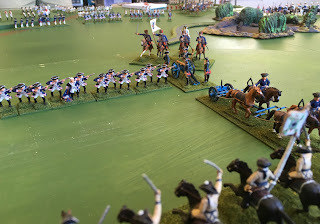 Note the small force of Rebel cavalry under Major Gordon, which had advanced to threaten the 12th Pennsylvanians. The Union cavalry was moved up to deter it the following move and their artillery also recommenced a move to the hill, though they never actually got there after being left stationary for one move. 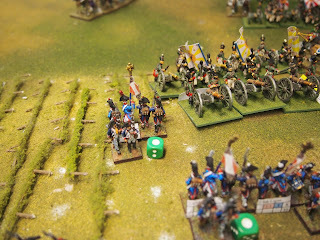 By now, however, the fight had really gone out of the Rebels. They had lost two stands, one of the 1st Kentucky in the melee on the right and one of 10th Alabama due to a fire-fight in Move 5, which had also seen the 11th Virginia and the 6th South Carolina disordered, whilst two stands had skedaddled, one from 1st Kentucky on their left and one from the 10th Alabama on the left whose melee had also gone disastrously awry. 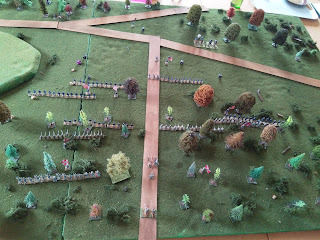 By contrast the Union had lost just one stand, in the melee on their right flank. No wonder that Jeb Stuart called it a day and abandoned the field to the Union. 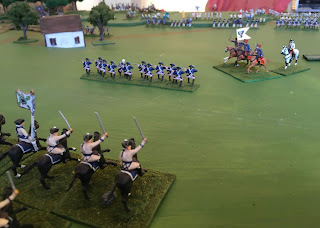 It was a really bad day at the office for him exactly as historically, As Brigadier-General Ord, I was grateful he did quit the field, because I still could not be certain how many more Rebels there were in the woods, so I had given the order to halt. Mark and I felt that Fire and Fury (1st edition) had passed our test with flying colours. 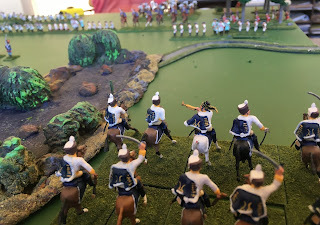 So far as verisimilitude was concerned, the losses (at 150 men per stand, and assuming actual casualties of around 1/3), came extremely close to the historical results. 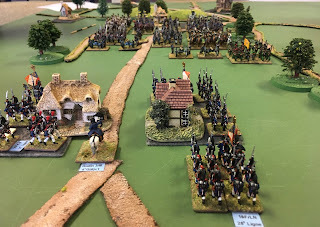 Not only that, but six game turns had been fought in around four hours even though we were almost entirely new to the rules, which bodes extremely well for fighting much more significant actions with them later on. 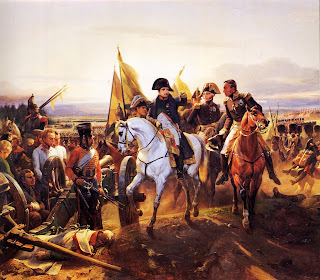 We therefore resolved to fight again later in the year once the armies on both sides were larger. 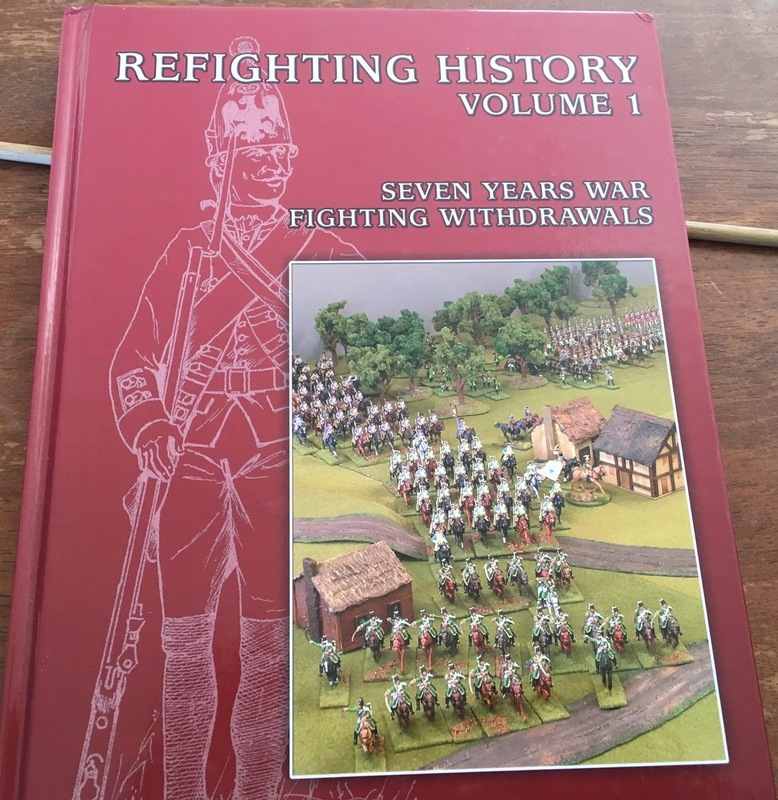 We also resolved to look at whether the 2nd edition of the rules brings any improvements, or just complexity for its own sake. 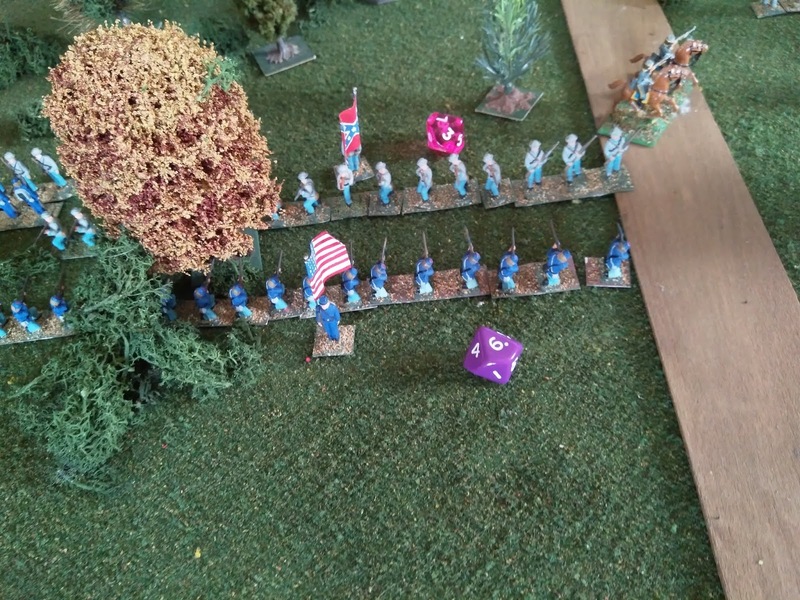 I had always wanted to fight ACW, and now I have. 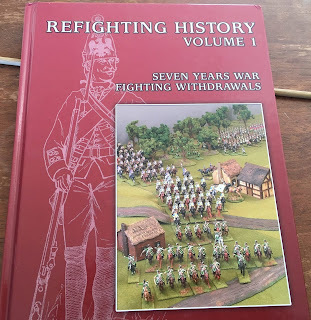 Why did I wait so long? 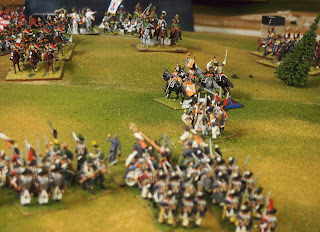 More about the strange title later. 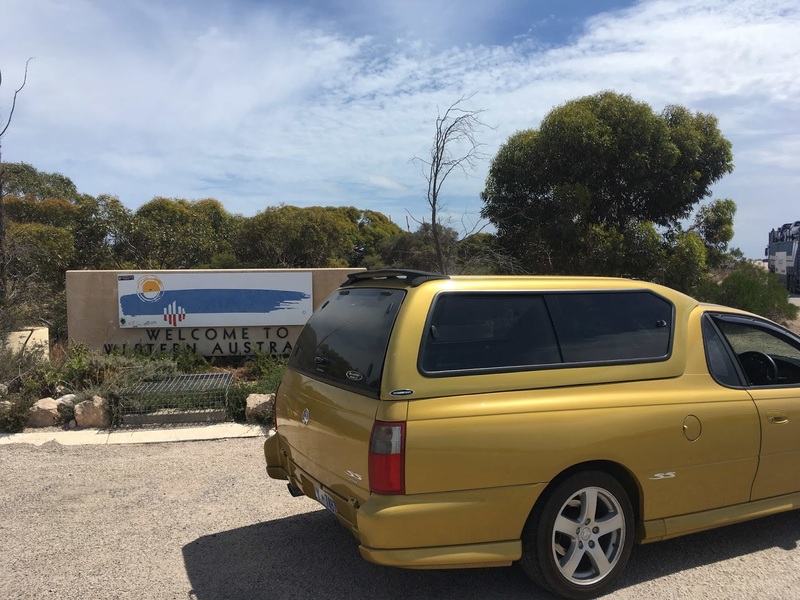 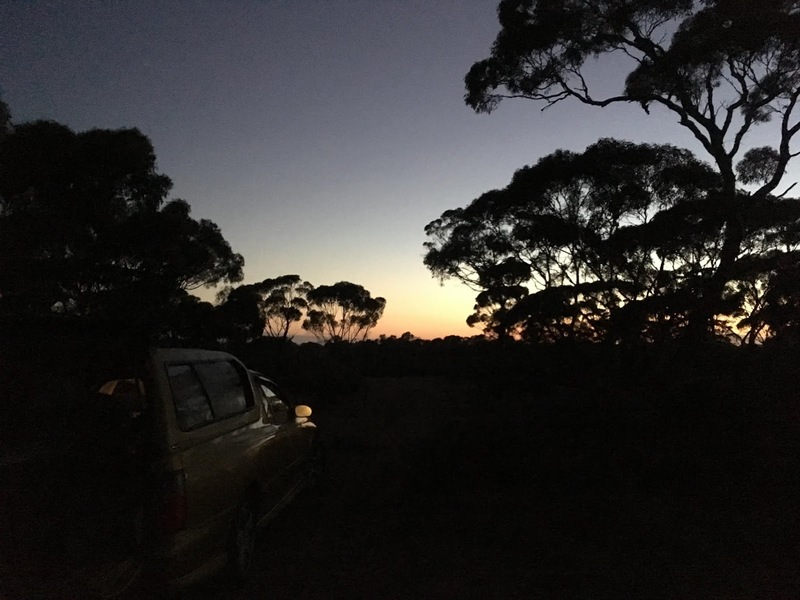 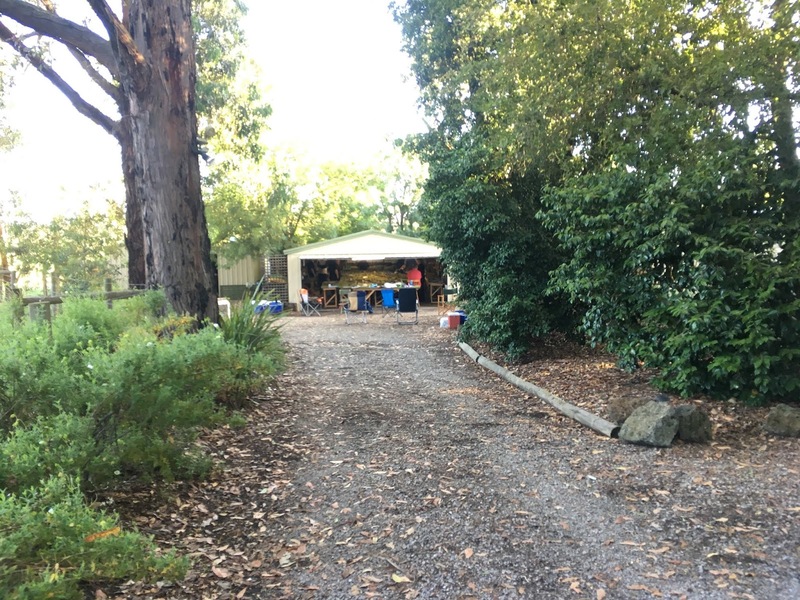 I have been inspired to put up this post after reading other bloggers' posts about plans for the year, as well as a long discussion with Julian about our own plans. 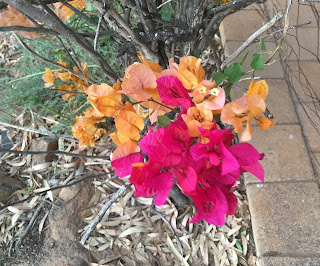 So, here goes with a navel-gazing post that I hope is of interest to others. In brief, the plans for our little group consist of individual projects that are in the mutual interest and will increase the diversity and perhaps frequency of games that we'll play over the coming year (and years). 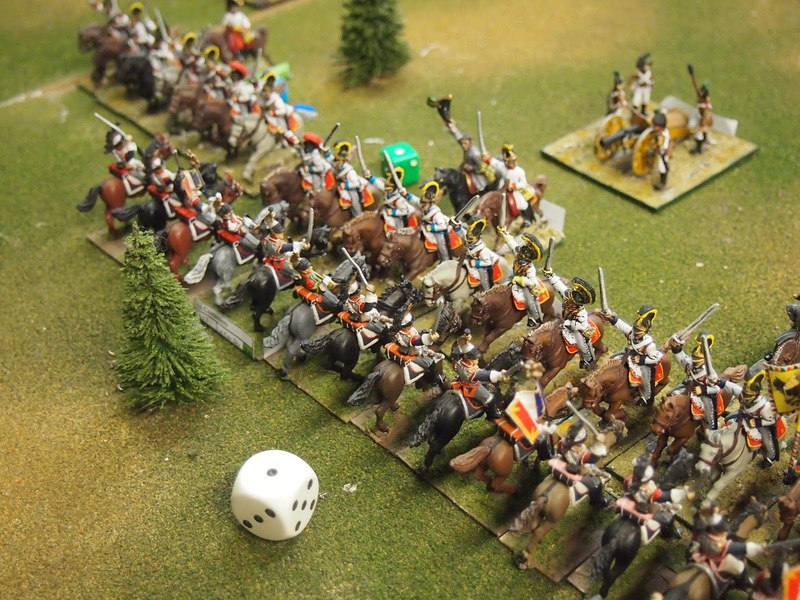 • Julian has several wargaming 'itches' to scratch. 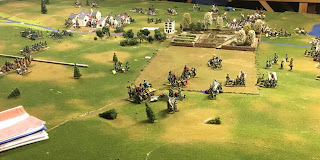 He is focussed on 'sorting out' American Civil War, World War I and World War II in terms of capacity to stage games and preferred rules for each period. He'll be hosting the first of these next week, so expect a report soon. Added to these he'll be continuing with Napoleonic naval (now that he has 'found' Grand Fleet Actions for us) and War of Spanish Succession. 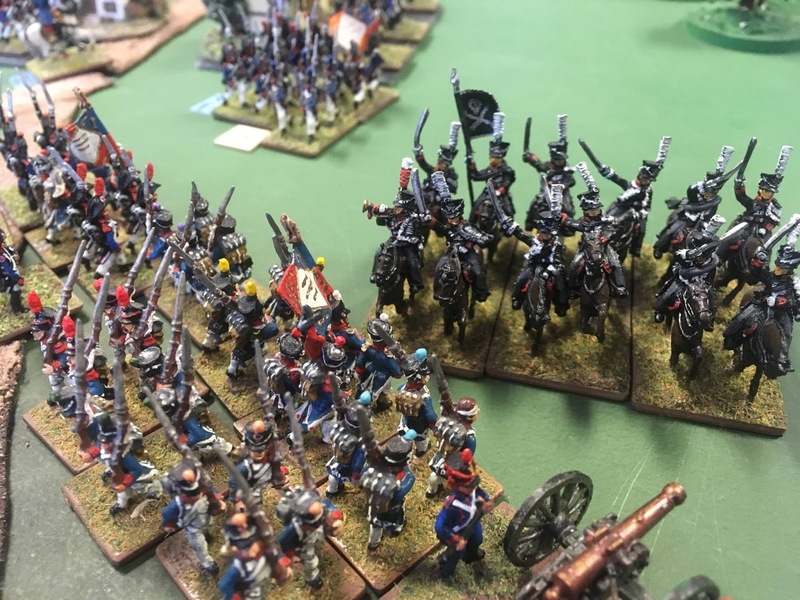 • I have not asked specifically what he has planned, but expect that Mark will 'do what Mark does'; that is quietly churn out a steady procession of beautifully painted units until he says, let's have a game of 'x'. I expect that he'll continue to add units to late-mediaeval, ancient (Greco-Roman and perhaps earlier 'classical' eras) and Seven Year's War/War of Austrian Succession armies, with some Napoleonics thrown in. He has mentioned about a game of Mons Graupius, so I expect that will happen soon. 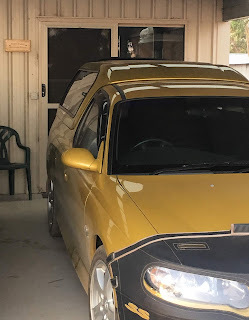 • In my case, I have a couple of 'itches' to scratch. 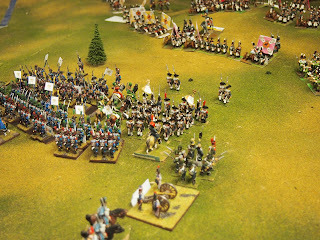 The first is to bring some of my many part-painted and unpainted figures to completion, focussing on Napoleonics. 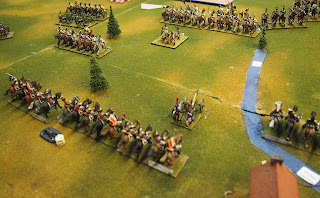 I began late last year with some French cavalry, 18 regiments of chasseurs à cheval, to be precise. 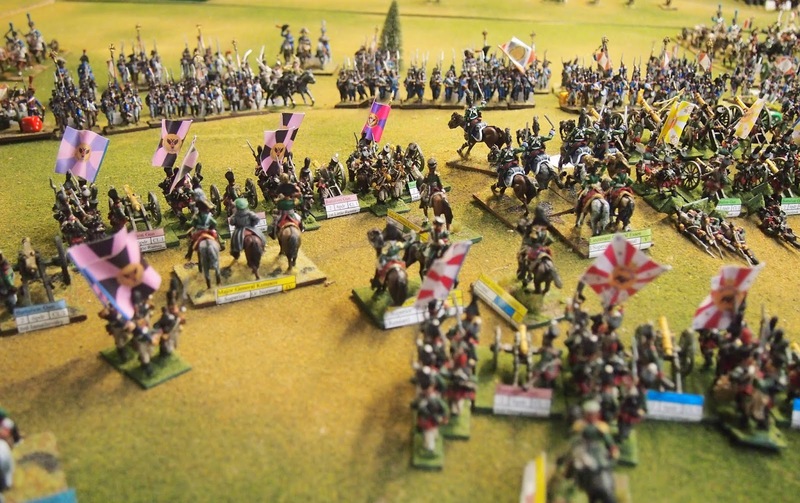 I like to paint a lot of units at once. 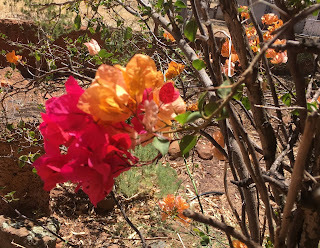 I doubt whether this increases my rate of output, but it helps with my self-perception (self-deception?). 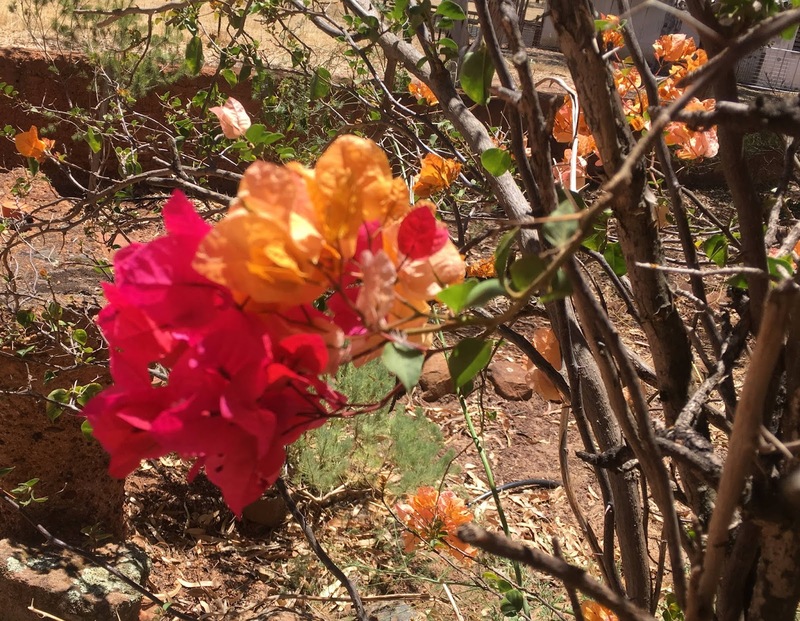 The second 'itch' is an opportunity that comes from the first. I want to try a wargaming idea that I have had for some time—I think that I dreamt it up myself, but one can never be sure. 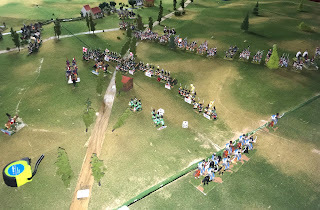 It is to stage the same game at two or more scales. 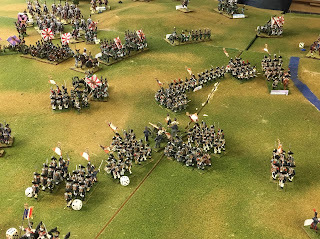 At its grandest this would involve representation from the strategic situation, to the overall battle, to sections of the battle, to detailed action within a section of the battle. 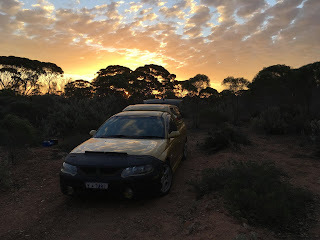 I have dubbed it the 'telescoping scales concept' (TSC), hence the catchy title for this post. 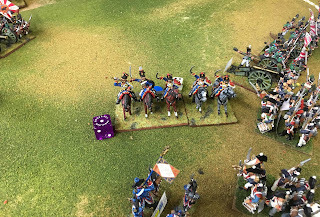 This is partly tongue-in-cheek and partly as an homage to the 'telescoping time concept' (TTC) of Empire. 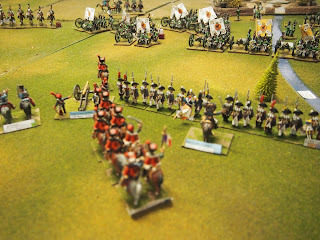 In essence it is nothing more that what wargamers do with campaigns, but with a few extra levels added in. 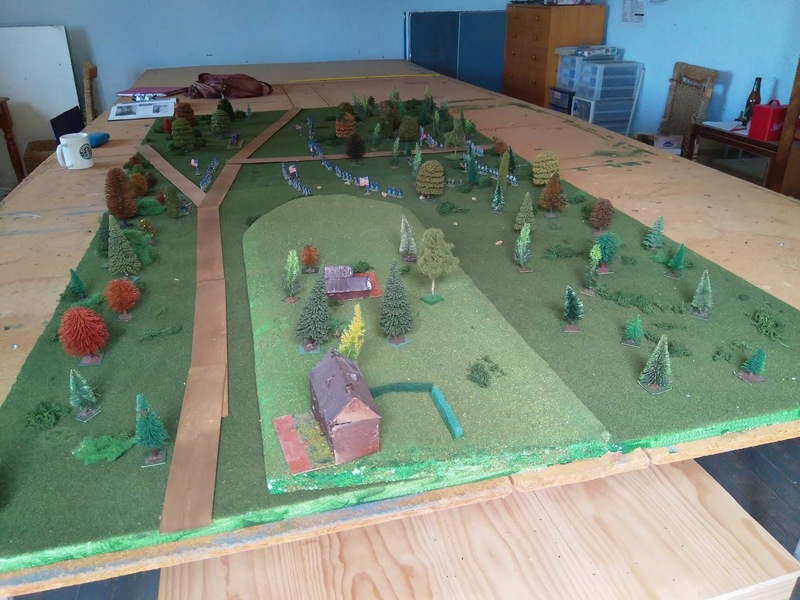 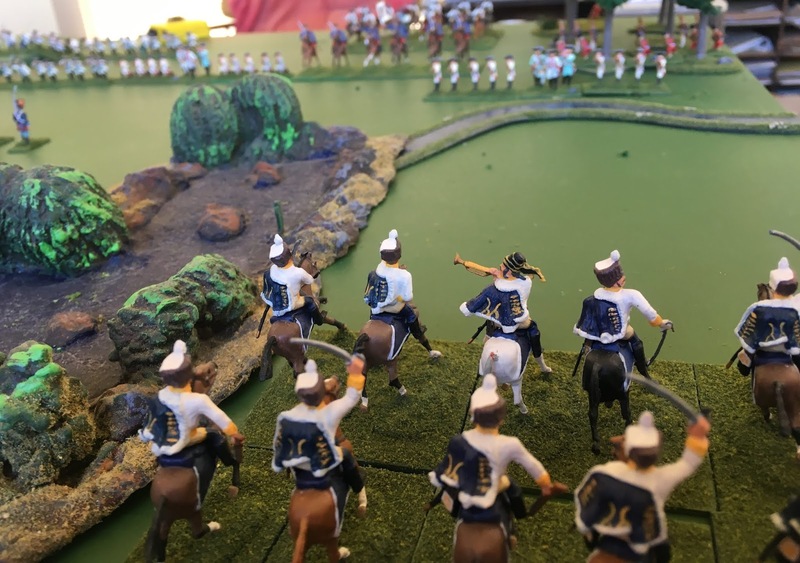 The 'gold star' version would involve several tables, or sections of a table, with figures of different scales depicting aspects of the same battle (perhaps even campaign). 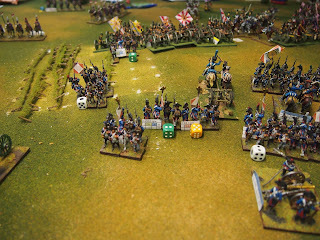 Play and players would move between the tables according to the desire to 'zoom in' on the action. 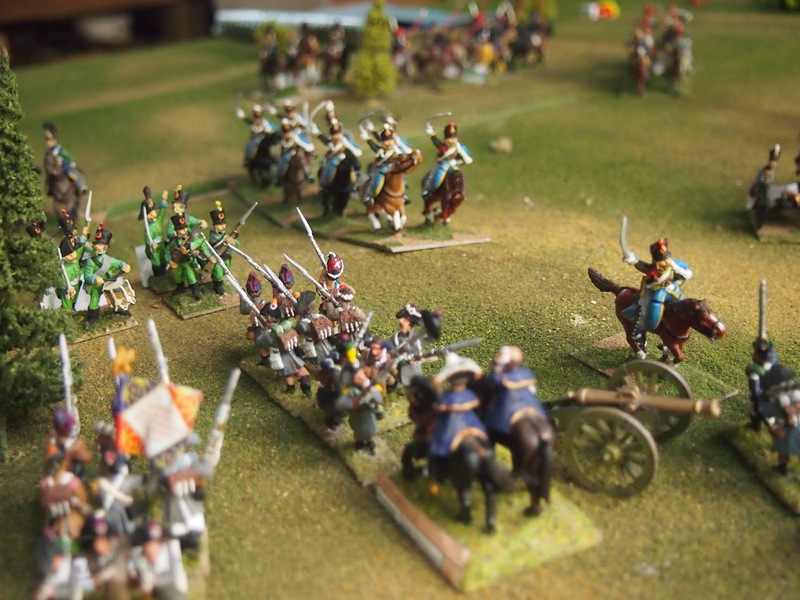 This could be codified, but I prefer it to be at the whim and interest of the player(s). 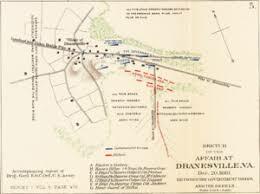 The results of actions conducted at the lower scales would be reflected back to the larger scales of the battle. 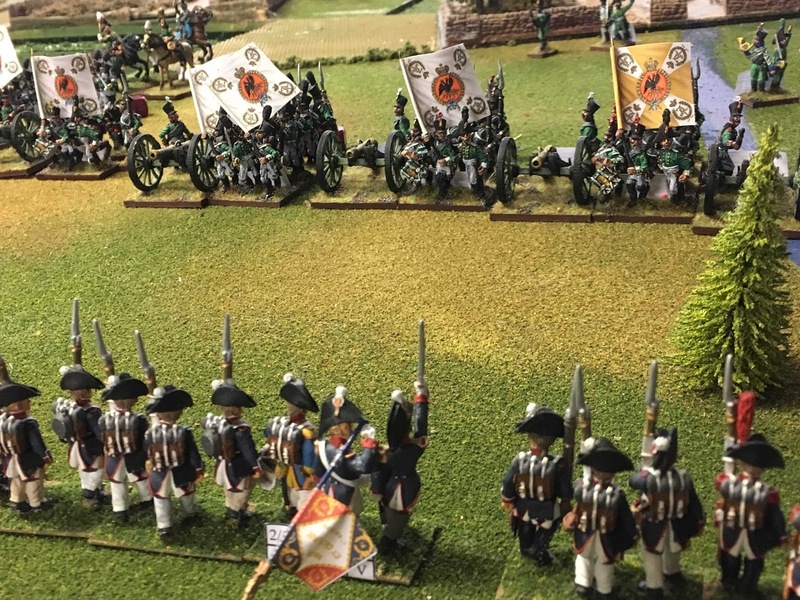 It definitely can be done, the question is whether it will work well enough to provide an interesting game and add to appreciation of the historical action. Once I have a few more units painted to completion, I plan to have a go at it solo. 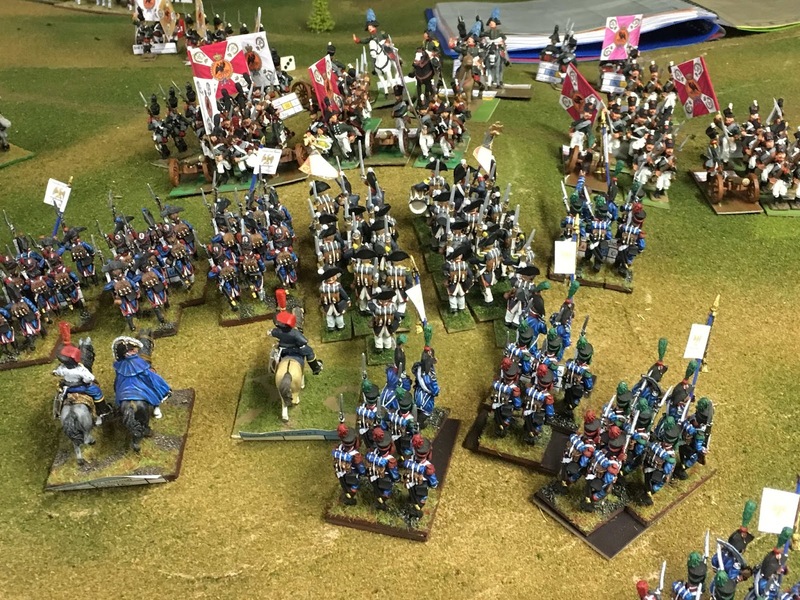 Anyway, that's a fair bit for a year I reckon. The combination of our efforts should keep us well and truly 'off the streets'. As with all plans it will be interesting to see how we go, what gets done, what is added or changed and what remains an 'itch' come late 2019. Not sure whether this is like David Essex in Jeff Wayne's War of the Worlds, but "I have made a start already"! 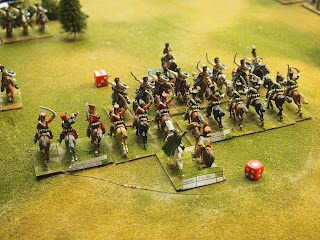 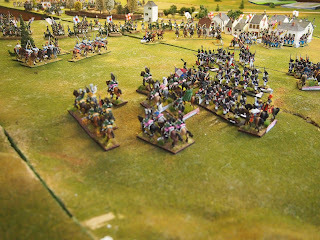 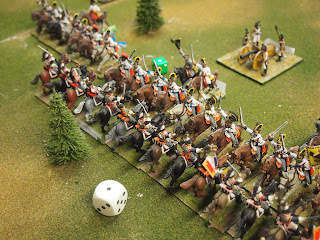 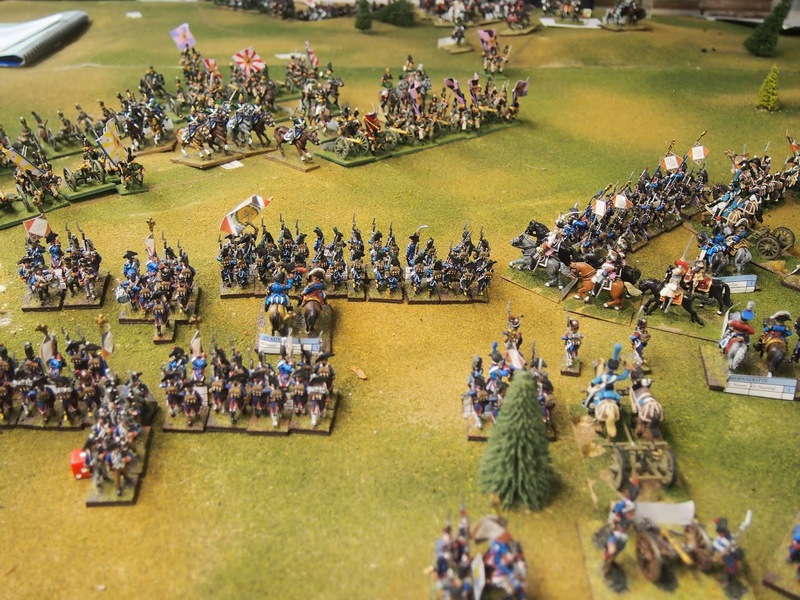 I began painting in earnest with the chasseurs à cheval, plus a few dragoons, late last year. 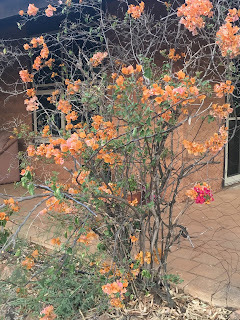 I made some pretty good progress, by my standards, before I went away, but 'lost' much of December and most of January. 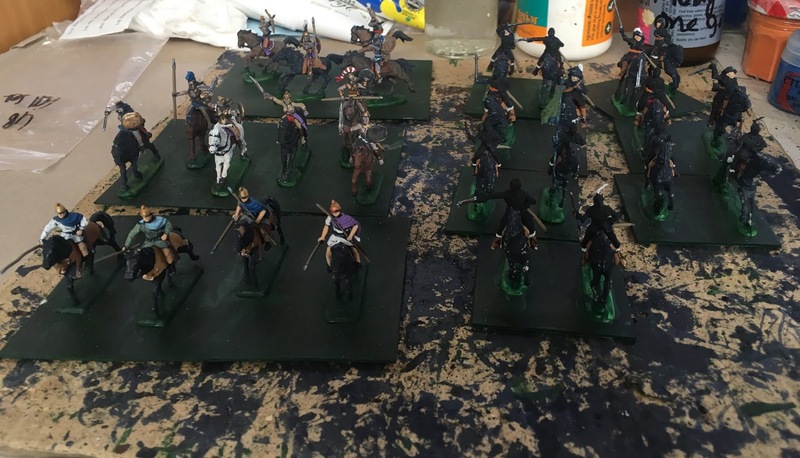 I use a black undercoat (Paynes' Grey to be precise) and like to stick figures on bases and riders on horses as soon as possible, so the figures are dark and on equally dark looking horses during the early stages of painting. 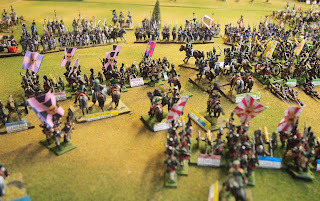 I'll throw in the odd unit from other periods, to keep them trickling along. 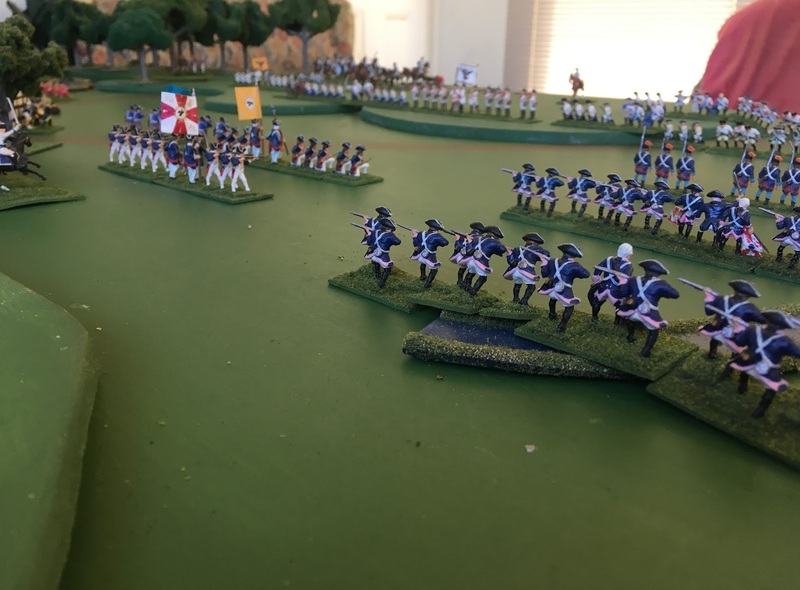 Jones' regiment of foote at rear, nearing completion. 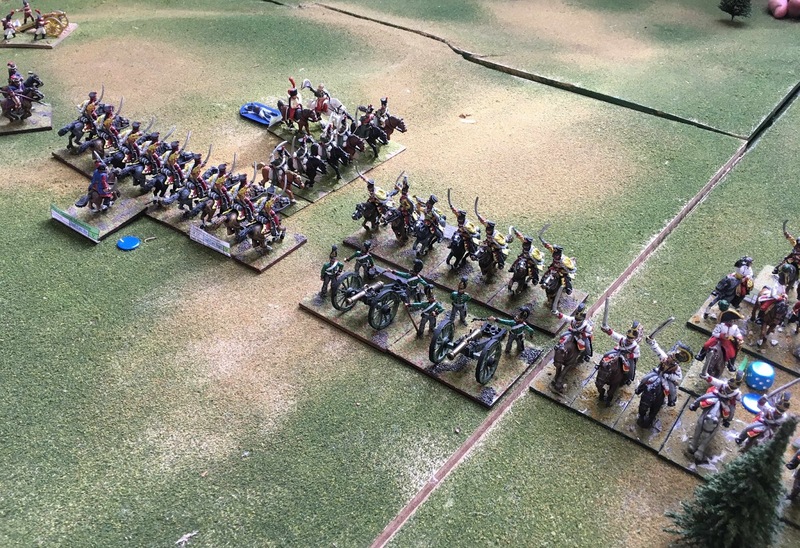 Hat Thracians, Dark Alliance Amazons and a mix of Revell and Mars figures as Hesilrige's Lobsters. 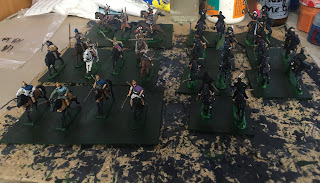 Base coat completed (not on all of the horses). Another little 'extra' thrown in, my new girl friend, Maria, of the Vistula Lancers. 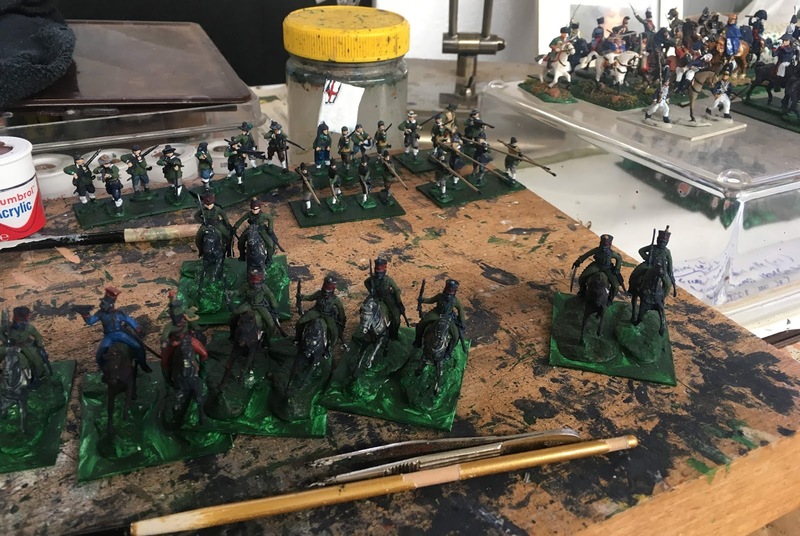 Base coat completed at time of the photo. 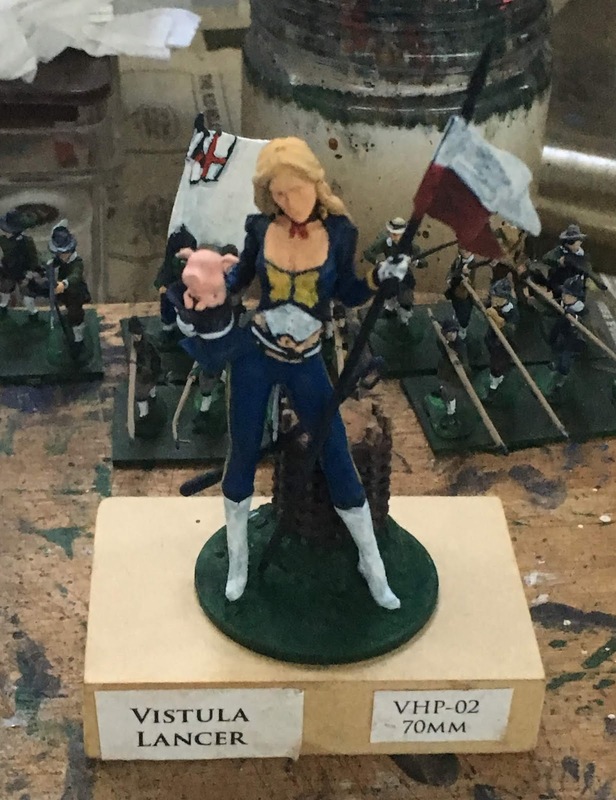 Figure by Bartek Drejewicz purchased from Valhalla online shop, Poland.